Most recent additions are highlighted in gray. 50 EMD/NS SD9M SD9M Unit had pilot striping. Unit has been retired. 51 EMD/NS SD9M SD9M Unit had pilot striping. Unit has been retired. 52 EMD/NS SD9M SD9M Unit had pilot striping. Unit has been retired. 54 EMD/NS SD9M SD9M Unit had pilot striping. Unit has been retired. 55 EMD/NS SD9M SD9M Unit had pilot striping. Unit has been retired. 57 EMD/NS SD9M SD9M Unit had pilot striping. Unit has been retired. 58 EMD/NS SD9M SD9M Unit had pilot striping. Unit has been retired. 59 EMD/NS SD9M SD9M Unit had pilot striping. Unit has been retired. 522 GE Dash 8-32B D8-32B Unit renumbered from NS 3522 in 10-2013. Unit has been retired. 523 GE Dash 8-32B D8-32B Unit renumbered from NS 3523 in 09-2013. Unit has been retired. 524 GE Dash 8-32B D8-32B Unit renumbered from NS 3524 in 09-2013. Unit has been retired. 525 GE Dash 8-32B D8-32B Unit renumbered from NS 3525 in 10-2013. Unit has been retired. 526 GE Dash 8-32B D8-32B Unit renumbered from NS 3522 in 10-2013. Unit has been retired. 528 GE Dash 8-32B D8-32B Unit renumbered from NS 3528 in 09-2013. Unit has been retired. 530 GE Dash 8-32B D8-32B Unit renumbered from NS 3530 in 09-2013. Unit has been retired. 531 GE Dash 8-32B D8-32B Unit renumbered from NS 3531 in 09-2013. Unit has been retired. 532 GE Dash 8-32B D8-32B Unit renumbered from NS 3532 in 09-2013. Unit has been retired. 533 GE Dash 8-32B D8-32B Unit renumbered from NS 3533 in 09-2013. Unit has been retired. 534 GE Dash 8-32B D8-32B Unit renumbered from NS 3522 in 10-2013. Unit has been retired. 537 GE Dash 8-32B D8-32B Unit renumbered from NS 3537 in 10-2013. Unit has been retired. 538 GE Dash 8-32B D8-32B Unit renumbered from NS 3538 in 09-2013. Unit has been retired. 539 GE Dash 8-32B D8-32B Unit renumbered from NS 3539 in 09-2013. Unit has been retired. 540 GE Dash 8-32B D8-32B Unit renumbered from NS 3522 in 10-2013. Unit has been retired. 542 GE Dash 8-32B D8-32B Unit renumbered from NS 3542 in 09-2013. Unit has been retired. 543 GE Dash 8-32B D8-32B Unit renumbered from NS 3543 in 10-2013. Unit has been retired. 545 GE Dash 8-32B D8-32B Unit renumbered from NS 3545 in 09-2013. Unit has been retired. 546 GE Dash 8-32B D8-32B Unit renumbered from NS 3546 in 10-2013. Unit has been retired. 548 GE Dash 8-32B D8-32B Unit renumbered from NS 3548 in 09-2013. Unit has been retired. 549 GE Dash 8-32B D8-32B Unit renumbered from NS 3549 in 09-2013. Unit has been retired. 550 GE Dash 8-32B D8-32B Unit renumbered from NS 3550 in 10-2013. Unit has been retired. 551 GE Dash 8-32B D8-32B Unit renumbered from NS 3551 in 09-2013. Unit has been retired. 552 GE Dash 8-32B D8-32B Unit renumbered from NS 3552 in 10-2013. Unit has been retired. 554 GE Dash 8-32B D8-32B Unit renumbered from NS 3554 in 09-2013. Unit has been retired. 556 GE Dash 8-32B D8-32B Unit renumbered from NS 3556 in 10-2013. Unit has been retired. 557 GE Dash 8-32B D8-32B Unit renumbered from NS 3557 in 09-2013. Unit has been retired. 558 GE Dash 8-32B D8-32B Unit renumbered from NS 3558 in 09-2013. Unit has been retired. 559 GE Dash 8-32B D8-32B Unit renumbered from NS 3559 in 10-2013. Unit has been retired. 560 GE Dash 8-32B D8-32B Unit renumbered from NS 3560 in 10-2013. Unit has been retired. 561 GE Dash 8-32B D8-32B Unit renumbered from NS 3522 in 10-2013. Unit has been retired. 562 GE Dash 8-32B D8-32B Unit renumbered from NS 3562 in 10-2013. Unit has been retired. 565 GE Dash 8-32B D8-32B Unit renumbered from NS 3565 in 09-2013. Unit has been retired. 914 EMD/NS RP-E4D Slug RP-E4D Unit has since been repainted in the horsehead scheme. 916 EMD/NS RP-E4D Slug RP-E4D Unit has since been repainted in the horsehead scheme. 918 EMD/NS RP-E4D Slug RP-E4D Unit has since been repainted in the horsehead scheme. 919 EMD/NS RP-E4D Slug RP-E4D Unit has since been repainted in the horsehead scheme. 921 EMD/NS RP-E4D Slug RP-E4D Unit has since been repainted in the horsehead scheme. 923 EMD/NS RP-E4D Slug RP-E4D Unit has since been repainted in the horsehead scheme. 924 EMD/NS RP-E4D Slug RP-E4D Unit has since been repainted in the horsehead scheme. 925 EMD/NS RP-E4D Slug RP-E4D Unit has since been repainted in the horsehead scheme. 926 EMD/NS RP-E4D Slug RP-E4D Unit has since been repainted in the horsehead scheme. 927 EMD/NS RP-E4D Slug RP-E4D Unit has since been repainted in the horsehead scheme. 929 EMD/NS RP-E4D Slug RP-E4D Unit has since been repainted in the horsehead scheme. 930 EMD/NS RP-E4D Slug RP-E4D Unit has since been repainted in the horsehead scheme. 932 EMD/NS RP-E4D Slug RP-E4D Unit has since been repainted in the horsehead scheme. 934 EMD/NS RP-E4D Slug RP-E4D Unit has since been repainted in the horsehead scheme. 936 EMD/NS RP-E4D Slug RP-E4D Unit has since been repainted in the horsehead scheme. 937 EMD/NS RP-E4D Slug RP-E4D Unit has since been repainted in the horsehead scheme. 939 EMD/NS RP-E4D Slug RP-E4D Unit has since been repainted in the horsehead scheme. 941 EMD/NS RP-E4D Slug RP-E4D Unit has since been repainted in the horsehead scheme. 944 EMD/SOU RP-E4U Slug RP-E4U Unit has been retired. 946 ALCO/SOU RP-A4U Slug RP-A4U Unit had pilot striping. Unit has been retired. 947 ALCO/SOU RP-A4U Slug RP-A4U Unit has been retired. 952 EMD/NS RP-E4U Slug RP-E4U Unit has pilot striping. 954 EMD/NS RP-E4U Slug RP-E4U Unit has pilot striping. 955 EMD/NS RP-E4U Slug RP-E4U Unit has since been repainted in the horsehead scheme. 957 EMD/NS RP-E4U Slug RP-E4U Unit has pilot striping. 958 EMD/NS RP-E4U Slug RP-E4U Unit has pilot striping. 959 EMD/NS RP-E4U Slug RP-E4U Unit has since been repainted in the horsehead scheme. 960 EMD/NS RP-E4U Slug RP-E4U Unit has since been repainted in the horsehead scheme. 961 EMD/NS RP-E4U Slug RP-E4U Unit has since been repainted in the horsehead scheme. 962 EMD/NS RP-E4U Slug RP-E4U Unit has since been repainted in the horsehead scheme. 963 EMD/NS RP-E4U Slug RP-E4U Unit had pilot striping. Unit has been retired. 964 EMD/NS RP-E4U Slug RP-E4U Unit had pilot striping. Unit has been retired. 974 ALCO/CR MT-6 Slug MT-6 Unit has since been upgraded to a NS RPU6 slug. 990 ALCO/NW RP-E6Y Slug RP-E6Y Unit has since been upgraded to a NS RPU6 slug. 991 ALCO/NW RP-E6Y Slug RP-E6Y Unit has since been upgraded to a NS RPU6 slug. 992 ALCO/NW RP-E6Y Slug RP-E6Y Unit has since been upgraded to a NS RPU6 slug. 993 ALCO/NW RP-E6Y Slug RP-E6Y Unit has since been upgraded to a NS RPU6 slug. 995 FM/NW RP-F6Y Slug RP-F6Y Unit has been retired. 996 FM/NW RP-F6Y Slug RP-F6Y Unit has been retired. 998 FM/NW RP-F6Y Slug RP-F6Y Unit has been retired. 1357 EMD GP40 GP40 Unit has since been rebuilt to a NS GP40-2. 1358 EMD GP40 GP40 Unit has since been rebuilt to a NS GP40-2. 1360 EMD GP40 GP40 Unit has since been rebuilt to a NS GP40-2. 1361 EMD GP40 GP40 Unit has since been rebuilt to a NS GP40-2. 1364 EMD GP40 GP40 Unit has since been rebuilt to a NS GP40-2. 1365 EMD GP40 GP40 Unit has since been rebuilt to a NS GP40-2. 1368 EMD GP40 GP40 Unit has since been rebuilt to a NS GP40-2. 1370 EMD GP40 GP40 Unit has since been rebuilt to a NS GP40-2. 1371 EMD GP40 GP40 Unit has since been rebuilt to a NS GP40-2. 1372 EMD GP40 GP40 Unit has since been rebuilt to a NS GP40-2. 1373 EMD GP40 GP40 Unit has since been rebuilt to a NS GP40-2. 1375 EMD GP40 GP40 Unit has since been rebuilt to a NS GP40-2. 1376 EMD GP40 GP40 Unit has since been rebuilt to a NS GP40-2. 1378 EMD GP40 GP40 Unit has since been rebuilt to a NS GP40-2. 1380 EMD GP40 GP40 Unit has since been rebuilt to a NS GP40-2. 1386 EMD GP40 GP40 Unit has been retired. 1388 EMD GP40 GP40 Unit has since been rebuilt to a NS GP40-2. 1580 EMD SD40 SD40 Unit has been retired. 1581 EMD SD40 SD40 Unit has since been rebuilt to a NS RPU6 slug. 1582 EMD SD40 SD40 Unit has since been rebuilt to a NS RPU6 slug. 1583 EMD SD40 SD40 Unit has since been rebuilt to a NS RPU6 slug. 1584 EMD SD40 SD40 Unit has since been rebuilt to a NS RPU6 slug. 1587 EMD SD40 SD40 Unit has since been rebuilt to a NS RPU6 slug. 1589 EMD SD40 SD40 Unit has since been rebuilt to a NS RPU6 slug. 1590 EMD SD40 SD40 Unit has since been rebuilt to a NS RPU6 slug. 1591 EMD SD40 SD40 Unit has since been rebuilt to a NS RPU6 slug. 1592 EMD SD40 SD40 Unit has since been rebuilt to a NS RPU6 slug. 1593 EMD SD40 SD40 Unit has since been rebuilt to a NS RPU6 slug. 1594 EMD SD40 SD40 Unit has since been rebuilt to a NS RPU6 slug. 1595 EMD SD40 SD40 Unit has since been rebuilt to a NS RPU6 slug. 1611 EMD SD40 SD40 Unit has been retired. 1614 EMD SD40 SD40 Unit has been retired. 1615 EMD SD40 SD40 Unit has since been rebuilt to a NS SD33ECO. 1619 EMD SD40 SD40 Unit has since been rebuilt to a NS RPU6 slug. 1620 EMD SD40 SD40 Unit has been retired. 1621 EMD SD40 SD40 Unit has been retired. 1622 EMD SD40 SD40 Unit has been retired. 1623 EMD SD40 SD40 Unit has been retired. 1627 EMD SD40-2 SD40-2 Unit has since been repainted in the horsehead scheme. 1628 EMD SD40-2 SD40-2 Unit has since been repainted in the horsehead scheme. 1631 EMD SD40-2 SD40-2 Unit has since been repainted in the horsehead scheme. 1632 EMD SD40-2 SD40-2 Unit has since been repainted in the horsehead scheme. 1633 EMD SD40-2 SD40-2 Unit has since been repainted in the horsehead scheme. 1635 EMD SD40-2 SD40-2 Unit has since been repainted in the horsehead scheme. 1636 EMD SD40-2 SD40-2 Unit has since been repainted in the horsehead scheme. 1637 EMD SD40-2 SD40-2 Unit has since been repainted in the horsehead scheme. 1638 EMD SD40-2 SD40-2 Unit has since been repainted in the horsehead scheme. 1639 EMD SD40-2 SD40-2 Unit has since been repainted in the horsehead scheme. 1641 EMD SD40-2 SD40-2 Unit has since been repainted in the horsehead scheme. 1642 EMD SD40-2 SD40-2 Unit has since been repainted in the horsehead scheme. 1643 EMD SD40-2 SD40-2 Unit has since been repainted in the horsehead scheme. 1644 EMD SD40-2 SD40-2 Unit has since been repainted in the horsehead scheme. 1645 EMD SD40-2 SD40-2 Unit has since been repainted in the horsehead scheme. 1646 EMD SD40-2 SD40-2 Unit has since been repainted in the horsehead scheme. 1647 EMD SD40-2 SD40-2 Unit has since been repainted in the horsehead scheme. 1648 EMD SD40-2 SD40-2 Unit has since been repainted in the horsehead scheme. 1649 EMD SD40-2 SD40-2 Unit has since been repainted in the horsehead scheme. 1650 EMD SD40-2 SD40-2 Unit has since been repainted in the horsehead scheme. 1651 EMD SD40-2 SD40-2 Unit has since been repainted in the horsehead scheme. 1652 EMD SD40-2 SD40-2 Unit has since been repainted in the horsehead scheme. 2101 EMD SW1001 SW1001 Former CR 9409/RDG 2609. Unit had pilot striping. Unit has been retired. 2102 EMD SW1001 SW1001 Former CR 9412/RDG 2612. Unit has pilot striping. 2210 EMD SW1500 SW1500 Former CR/PC 9524. Unit had pilot striping and white cab roof. Unit has been retired. 2220 EMD SW1500 SW1500 Former CR/PC 9560. Unit had pilot striping. Unit has been retired. 2292 EMD SW1500 SW1500 Unit had pilot striping and white cab roof. Unit has been retired. 2310 EMD SW1500 SW1500 Unit had pilot striping. Unit has been retired. 2316 EMD SW1500 SW1500 Unit had pilot striping. Unit has been retired. 2330 EMD SW1500 SW1500 Unit was repainted in the horsehead scheme and eventually retired. 2331 EMD SW1500 SW1500 Unit had pilot striping. Unit has been retired. 2332 EMD SW1500 SW1500 Unit was repainted in the horsehead scheme and eventually retired..
2336 EMD SW1500 SW1500 Unit had pilot striping and white cab roof. Unit has been retired. 2338 EMD SW1500 SW1500 Unit had pilot striping. Unit has been retired. 2339 EMD SW1500 SW1500 Unit had pilot striping. Unit has been retired. 2344 EMD SW1500 SW1500 Unit had pilot striping. Unit has been retired. 2346 EMD SW1500 SW1500 Unit had pilot striping. Unit has been retired. 2348 EMD MP15DC MP15DC Unit had pilot striping. Unit was wrecked and was retired. 2349 EMD MP15DC MP15DC Unit has since been repainted in the horsehead scheme. 2350 EMD MP15DC MP15DC Unit has since been repainted in the horsehead scheme. 2351 EMD MP15DC MP15DC Unit has pilot striping. Unit has been retired. 2353 EMD MP15DC MP15DC Unit had pilot striping. Unit has been retired. 2354 EMD MP15DC MP15DC Unit had pilot striping. Unit has been retired. 2355 EMD MP15DC MP15DC Unit has since been repainted in the horsehead scheme. 2356 EMD MP15DC MP15DC Unit has since been upgraded to MP15E and repainted in the horsehead scheme. 2357 EMD MP15DC MP15DC Unit has since been repainted in the horsehead scheme. 2359 EMD MP15DC MP15DC Unit has since been repainted in the horsehead scheme. 2360 EMD MP15DC MP15DC Unit has since been repainted in the horsehead scheme. 2361 EMD MP15DC MP15DC Unit has since been repainted in the horsehead scheme. 2362 EMD MP15DC MP15DC Unit has since been upgraded to MP15E and repainted in the horsehead scheme. 2363 EMD MP15DC MP15DC Unit has since been upgraded to MP15E and repainted in the horsehead scheme. 2365 EMD MP15DC MP15DC Unit has since been repainted in the horsehead scheme. 2367 EMD MP15DC MP15DC Unit has since been upgraded to MP15E and repainted in the horsehead scheme. 2368 EMD MP15DC MP15DC Unit has since been upgraded to MP15E and repainted in the horsehead scheme. 2369 EMD MP15DC MP15DC No longer on lease to, but was still lettered for NPBL. Unit has been retired. 2371 EMD MP15DC MP15DC Unit has since been upgraded to MP15E and repainted in the horsehead scheme. 2372 EMD MP15DC MP15DC Unit has been retired. 2373 EMD MP15DC MP15DC Unit has since been upgraded to MP15E and repainted in the horsehead scheme. 2374 EMD MP15DC MP15DC Unit has since been upgraded to MP15E and repainted in the horsehead scheme. 2375 EMD MP15DC MP15DC Unit has been retired. 2377 EMD MP15DC MP15DC Unit had pilot striping. Unit has been retired. 2378 EMD MP15DC MP15DC Unit has since been repainted in the horsehead scheme. 2379 EMD MP15DC MP15DC Unit has since been repainted in the horsehead scheme. 2380 EMD MP15DC MP15DC Unit has been retired. 2381 EMD MP15DC MP15DC Unit has since been repainted in the horsehead scheme. 2382 EMD MP15DC MP15DC Unit has been retired. 2383 EMD MP15DC MP15DC Unit has since been upgraded to MP15E and repainted in the horsehead scheme. 2384 EMD MP15DC MP15DC Unit has since been upgraded to MP15E and repainted in the horsehead scheme. 2385 EMD MP15DC MP15DC Unit had pilot striping. Unit has been retired. 2386 EMD MP15DC MP15DC Unit has since been upgraded to MP15E and repainted in the horsehead scheme. 2387 EMD MP15DC MP15DC Unit had pilot striping. Unit has been retired. 2388 EMD MP15DC MP15DC Unit has since been repainted in the horsehead scheme. 2390 EMD MP15DC MP15DC Unit had pilot striping. Unit has been retired. 2391 EMD MP15DC MP15DC Unit had pilot striping. Unit has been retired. 2393 EMD MP15DC MP15DC Unit has since been upgraded to MP15E and repainted in the horsehead scheme. 2394 EMD MP15DC MP15DC Unit has since been repainted in the horsehead scheme. 2395 EMD MP15DC MP15DC Unit had pilot striping. Unit has been retired. 2396 EMD MP15DC MP15DC Unit has pilot striping. Unit has been retired. 2397 EMD MP15DC MP15DC Unit had pilot striping. Unit has been retired. 2398 EMD MP15DC MP15DC Unit has since been upgraded to MP15E and repainted in the horsehead scheme. 2399 EMD MP15DC MP15DC Unit has since been repainted in the horsehead scheme. 2400 EMD MP15DC MP15DC Unit has since been upgraded to MP15E and repainted in the horsehead scheme. 2401 EMD MP15DC MP15DC Unit has since been repainted in the horsehead scheme. 2403 EMD MP15DC MP15DC Unit has since been upgraded to MP15E and repainted in the horsehead scheme. 2404 EMD MP15DC MP15DC Unit has since been repainted in the horsehead scheme. 2405 EMD MP15DC MP15DC Unit had pilot striping. Unit has been retired. 2406 EMD MP15DC MP15DC Unit has pilot striping. Unit has since been repainted in the horsehead scheme. 2407 EMD MP15DC MP15DC Unit has since been upgraded to MP15E and repainted in the horsehead scheme. 2408 EMD MP15DC MP15DC Unit had pilot striping and white cab roof. Unit has been retired. 2409 EMD MP15DC MP15DC Unit has since been repainted in the horsehead scheme. 2410 EMD MP15DC MP15DC Unit has since been repainted in the horsehead scheme. 2411 EMD MP15DC MP15DC Unit has pilot striping. Unit has been retired. 2414 EMD MP15DC MP15DC Unit had pilot striping. Unit has been retired. 2415 EMD MP15DC MP15DC Unit has since been upgraded to MP15E and repainted in the horsehead scheme. 2416 EMD MP15DC MP15DC Unit has since been upgraded to MP15E and repainted in the horsehead scheme. 2417 EMD MP15DC MP15DC Unit has since been repainted in the horsehead scheme. 2418 EMD MP15DC MP15DC Unit has since been repainted in the horsehead scheme. 2419 EMD MP15DC MP15DC Unit has been retired. 2420 EMD MP15DC MP15DC Unit has since been upgraded to MP15E and repainted in the horsehead scheme. 2421 EMD MP15DC MP15DC Unit has since been repainted in the horsehead scheme. 2422 EMD MP15DC MP15DC Unit has since been repainted in the horsehead scheme. 2423 EMD MP15DC MP15DC Unit has since been upgraded to MP15E and repainted in the horsehead scheme. 2424 EMD MP15DC MP15DC Unit had pilot striping. Unit has been retired. 2425 EMD MP15DC MP15DC Unit has since been repainted in the horsehead scheme. 2426 EMD MP15DC MP15DC Unit ha pilot striping. Unit has been retired. 2427 EMD MP15DC MP15DC Unit has since been repainted in the horsehead scheme. 2428 EMD MP15DC MP15DC No longer on lease to, but was still lettered for NPBL. Unit has been retired. 2429 EMD MP15DC MP15DC Unit has since been upgraded to MP15E and repainted in the horsehead scheme. 2430 EMD MP15DC MP15DC Unit has since been upgraded to MP15E and repainted in the horsehead scheme. 2431 EMD MP15DC MP15DC Unit has since been upgraded to MP15E and repainted in the horsehead scheme. 2432 EMD MP15DC MP15DC Unit has since been upgraded to MP15E and repainted in the horsehead scheme. 2433 EMD MP15DC MP15DC Unit had pilot striping. Unit has been retired. 2434 EMD MP15DC MP15DC Unit had pilot striping and white cab roof. Unit has been retired. 2435 EMD MP15DC MP15DC Unit had pilot striping. Unit has been retired. 2501 EMD SD70 SD70 Unit has since been repainted in the horsehead scheme. 2503 EMD SD70 SD70 Unit retired/rebuilt as an SD70ACC. 2504 EMD SD70 SD70 Unit has since been repainted in the horsehead scheme. 2505 EMD SD70 SD70 Unit has since been repainted in the horsehead scheme. 2507 EMD SD70 SD70 Unit has since been repainted in the horsehead scheme. 2508 EMD SD70 SD70 Unit has since been repainted in the horsehead scheme. 2509 EMD SD70 SD70 Unit has since been repainted in the horsehead scheme. 2510 EMD SD70 SD70 Unit retired/rebuilt as an SD70ACC. 2512 EMD SD70 SD70 Unit has since been repainted in the horsehead scheme. 2514 EMD SD70 SD70 Unit retired/rebuilt as an SD70ACC. 2517 EMD SD70 SD70 Unit retired for rebuilding as an SD70ACC. 2518 EMD SD70 SD70 Unit has since been repainted in the horsehead scheme. 2521 EMD SD70 SD70 Unit retired/rebuilt as an SD70ACC. 2522 EMD SD70 SD70 Unit retired for rebuilding as an SD70ACC. 2524 EMD SD70 SD70 Unit retired/rebuilt as an SD70ACC. 2525 EMD SD70 SD70 Unit retired for rebuilding as an SD70ACC. 2527 EMD SD70 SD70 Unit has since been repainted in the horsehead scheme. 2528 EMD SD70 SD70 Unit has since been repainted in the horsehead scheme. 2530 EMD SD70 SD70 Unit retired for rebuilding as an SD70ACC. 2531 EMD SD70 SD70 Unit retired for rebuilding as an SD70ACC. 2532 EMD SD70 SD70 Unit has since been repainted in the horsehead scheme. 2533 EMD SD70 SD70 Unit has since been repainted in the horsehead scheme. 2534 EMD SD70 SD70 Unit has since been repainted in the horsehead scheme. 2536 EMD SD70 SD70 Unit has since been repainted in the horsehead scheme. 2537 EMD SD70 SD70 Unit retired/rebuilt as an SD70ACC. 2538 EMD SD70 SD70 Unit retired/rebuilt as an SD70ACC. 2541 EMD SD70 SD70 Unit has since been repainted in the horsehead scheme. 2542 EMD SD70 SD70 Unit has since been repainted in the horsehead scheme. 2544 EMD SD70 SD70 Unit has since been repainted in the horsehead scheme. 2546 EMD SD70 SD70 Unit retired/rebuilt as an SD70ACC. 2547 EMD SD70 SD70 Unit has since been repainted in the horsehead scheme. 2548 EMD SD70 SD70 Unit has since been repainted in the horsehead scheme. 2549 EMD SD70 SD70 Unit has since been repainted in the horsehead scheme. 2552 EMD SD70 SD70 Unit has since been repainted in the horsehead scheme. 2553 EMD SD70 SD70 Unit has since been repainted in the horsehead scheme. 2555 EMD SD70 SD70 Unit has since been repainted in the horsehead scheme. 2586 EMD SD70M SD70M Unit has since been repainted in the horsehead scheme. 2834 EMD GP38AC GP38AC Unit has been retired. 2835 EMD GP38AC GP38AC Unit has been retired. 2837 EMD GP38AC GP38AC Unit has been retired. 2838 EMD GP38AC GP38AC Unit has been retired. 2843 EMD GP38AC GP38AC Unit has been retired. 2844 EMD GP38AC GP38AC Unit has been retired. 2845 EMD GP38AC GP38AC Unit has been retired. 2846 EMD GP38AC GP38AC Unit has been retired. 2847 EMD GP38AC GP38AC Unit has since been rebuilt to an NS RP-M4C. 2849 EMD GP38AC GP38AC Unit has been retired. 2851 EMD GP38AC GP38AC Unit has been retired. 2854 EMD GP38AC GP38AC Unit has since been rebuilt to NS a GP38-2. 2856 EMD GP38AC GP38AC Unit has since been rebuilt to a NS GP40-2. 2863 EMD GP38AC GP38AC Unit has since been rebuilt to a NS GP40-2. 2864 EMD GP38AC GP38AC Unit has been retired. 2867 EMD GP38AC GP38AC Unit has been retired. 2868 EMD GP38AC GP38AC Unit has been retired. 2869 EMD GP38AC GP38AC Unit has since been rebuilt to a NS GP38-2. 2872 EMD GP38AC GP38AC Unit has since been rebuilt to a NS GP40-2. 2873 EMD GP38AC GP38AC Unit has been retired. 2878 EMD GP38AC GP38AC Unit has been retired. 3043 EMD GP40-2 GP40-2 Former CR 3352. Unit has since been repainted in the horsehead scheme. 3068 EMD GP40-2 GP40-2 Former CR 3400. Unit has since been repainted in the horsehead scheme. 3170 EMD SD40 SD40 Unit was retired in 2007. Put back into service 2/2015 in Southern Railway "tuxedo" scheme with white frame striping. Unit retired in May 2016 and donated to Tennessee Valley Railroad Museum. 3171 EMD SD40 SD40 Unit has been retired. 3176 EMD SD40 SD40 Unit has been retired. 3177 EMD SD40 SD40 Unit has been retired. 3180 EMD SD40 SD40 Unit has been retired. 3182 EMD SD40 SD40 Unit has been retired. 3183 EMD SD40 SD40 Unit has been retired. 3184 EMD SD40 SD40 Unit has been retired. 3187 EMD SD40 SD40 Unit has been retired. 3189 EMD SD40 SD40 Unit has been retired. 3190 EMD SD40 SD40 Unit has been retired. 3192 EMD SD40 SD40 Unit has been retired. 3194 EMD SD40 SD40 Unit has since been rebuilt to a NS SD33ECO. 3196 EMD SD40 SD40 Unit has been retired. 3200 EMD SD40 SD40 Unit has been retired. 3201 EMD SD40-2 SD40-2 Unit has since been rebuilt with low short hood and repainted in the horsehead scheme. 3202 EMD SD40-2 SD40-2 Unit has since been rebuilt with low short hood and repainted in the horsehead scheme. 3203 EMD SD40-2 SD40-2 Unit has since been rebuilt with low short hood and repainted in the horsehead scheme. 3204 EMD SD40-2 SD40-2 Unit has since been rebuilt with low short hood and repainted in the horsehead scheme. 3205 EMD SD40-2 SD40-2 Unit has since been rebuilt with low short hood and repainted in the horsehead scheme. 3208 EMD SD40-2 SD40-2 Unit has since been rebuilt with low short hood and repainted in the horsehead scheme. 3209 EMD SD40-2 SD40-2 Unit has since been rebuilt with low short hood and repainted in the horsehead scheme. 3211 EMD SD40-2 SD40-2 Unit has since been rebuilt with low short hood and repainted in the horsehead scheme. 3212 EMD SD40-2 SD40-2 Unit has since been rebuilt with low short hood and repainted in the horsehead scheme. 3213 EMD SD40-2 SD40-2 Unit has since been rebuilt with low short hood and repainted in the horsehead scheme. 3214 EMD SD40-2 SD40-2 Unit has since been rebuilt with low short hood and repainted in the horsehead scheme. 3216 EMD SD40-2 SD40-2 Unit has since been rebuilt with low short hood and repainted in the horsehead scheme. 3218 EMD SD40-2 SD40-2 Unit has since been rebuilt with low short hood and repainted in the horsehead scheme. 3219 EMD SD40-2 SD40-2 Unit has since been rebuilt with low short hood and repainted in the horsehead scheme. 3220 EMD SD40-2 SD40-2 Unit has since been rebuilt with low short hood and repainted in the horsehead scheme. 3221 EMD SD40-2 SD40-2 Unit has since been rebuilt with low short hood and repainted in the horsehead scheme. 3222 EMD SD40-2 SD40-2 Unit has since been rebuilt with low short hood and repainted in the horsehead scheme. 3223 EMD SD40-2 SD40-2 Unit has since been rebuilt with low short hood and repainted in the horsehead scheme. 3227 EMD SD40-2 SD40-2 Unit has since been rebuilt with low short hood and repainted in the horsehead scheme. 3228 EMD SD40-2 SD40-2 Unit has since been rebuilt with low short hood and repainted in the horsehead scheme. 3229 EMD SD40-2 SD40-2 Unit has since been rebuilt with low short hood and repainted in the horsehead scheme. 3230 EMD SD40-2 SD40-2 Unit has since been rebuilt with low short hood and repainted in the horsehead scheme. 3232 EMD SD40-2 SD40-2 Unit has since been rebuilt with low short hood and repainted in the horsehead scheme. 3235 EMD SD40-2 SD40-2 Unit has since been rebuilt with low short hood and repainted in the horsehead scheme. 3237 EMD SD40-2 SD40-2 Unit has since been rebuilt with low short hood and repainted in the horsehead scheme. 3238 EMD SD40-2 SD40-2 Unit has since been rebuilt with low short hood and repainted in the horsehead scheme. 3240 EMD SD40-2 SD40-2 Unit has since been rebuilt with low short hood and repainted in the horsehead scheme. 3241 EMD SD40-2 SD40-2 Unit has since been rebuilt with low short hood and repainted in the horsehead scheme. 3242 EMD SD40-2 SD40-2 Unit has since been rebuilt with low short hood and repainted in the horsehead scheme. 3243 EMD SD40-2 SD40-2 Unit has since been rebuilt with low short hood and repainted in the horsehead scheme. 3255 EMD SD40-2 SD40-2 Unit has since been rebuilt with low short hood and repainted in the horsehead scheme. 3256 EMD SD40-2 SD40-2 Unit has since been rebuilt with low short hood and repainted in the horsehead scheme. 3258 EMD SD40-2 SD40-2 Unit has since been rebuilt with low short hood and repainted in the horsehead scheme. 3259 EMD SD40-2 SD40-2 Unit has since been rebuilt with low short hood and repainted in the horsehead scheme. 3260 EMD SD40-2 SD40-2 Unit has since been rebuilt with low short hood and repainted in the horsehead scheme. 3261 EMD SD40-2 SD40-2 Unit has since been rebuilt with low short hood and repainted in the horsehead scheme. 3262 EMD SD40-2 SD40-2 Unit has since been rebuilt with low short hood and repainted in the horsehead scheme. 3263 EMD SD40-2 SD40-2 Unit has since been rebuilt with low short hood and repainted in the horsehead scheme. 3264 EMD SD40-2 SD40-2 Unit has since been rebuilt with low short hood and repainted in the horsehead scheme. 3265 EMD SD40-2 SD40-2 Unit has since been rebuilt with low short hood and repainted in the horsehead scheme. 3266 EMD SD40-2 SD40-2 Unit has since been rebuilt with low short hood and repainted in the horsehead scheme. 3269 EMD SD40-2 SD40-2 Unit has since been rebuilt with low short hood and repainted in the horsehead scheme. 3270 EMD SD40-2 SD40-2 Unit has since been rebuilt with low short hood and repainted in the horsehead scheme. 3271 EMD SD40-2 SD40-2 Unit has since been rebuilt with low short hood and repainted in the horsehead scheme. 3272 EMD SD40-2 SD40-2 Unit has since been rebuilt with low short hood and repainted in the horsehead scheme. 3273 EMD SD40-2 SD40-2 Unit has since been rebuilt with low short hood and repainted in the horsehead scheme. 3274 EMD SD40-2 SD40-2 Unit has since been rebuilt with low short hood and repainted in the horsehead scheme. 3275 EMD SD40-2 SD40-2 Unit has since been rebuilt with low short hood and repainted in the horsehead scheme. 3278 EMD SD40-2 SD40-2 Unit has since been rebuilt with low short hood and repainted in the horsehead scheme. 3279 EMD SD40-2 SD40-2 Unit has since been rebuilt with low short hood and repainted in the horsehead scheme. 3281 EMD SD40-2 SD40-2 Unit has since been rebuilt with low short hood and repainted in the horsehead scheme. 3282 EMD SD40-2 SD40-2 Unit has since been rebuilt with low short hood and repainted in the horsehead scheme. 3283 EMD SD40-2 SD40-2 Unit has since been rebuilt with low short hood and repainted in the horsehead scheme. 3285 EMD SD40-2 SD40-2 Unit has since been rebuilt with low short hood and repainted in the horsehead scheme. 3286 EMD SD40-2 SD40-2 Unit has since been rebuilt with low short hood and repainted in the horsehead scheme. 3287 EMD SD40-2 SD40-2 Unit has since been rebuilt with low short hood and repainted in the horsehead scheme. 3289 EMD SD40-2 SD40-2 Unit has since been rebuilt with low short hood and repainted in the horsehead scheme. 3290 EMD SD40-2 SD40-2 Unit has since been rebuilt with low short hood and repainted in the horsehead scheme. 3291 EMD SD40-2 SD40-2 Unit has since been rebuilt with low short hood and repainted in the horsehead scheme. 3292 EMD SD40-2 SD40-2 Unit has since been rebuilt with low short hood and repainted in the horsehead scheme. 3293 EMD SD40-2 SD40-2 Unit has since been rebuilt with low short hood and repainted in the horsehead scheme. 3294 EMD SD40-2 SD40-2 Unit has since been rebuilt with low short hood and repainted in the horsehead scheme. 3295 EMD SD40-2 SD40-2 Unit has since been rebuilt with low short hood and repainted in the horsehead scheme. 3296 EMD SD40-2 SD40-2 Unit has since been rebuilt with low short hood and repainted in the horsehead scheme. 3297 EMD SD40-2 SD40-2 Unit has since been rebuilt with low short hood and repainted in the horsehead scheme. 3298 EMD SD40-2 SD40-2 Unit has since been rebuilt with low short hood and repainted in the horsehead scheme. 3299 EMD SD40-2 SD40-2 Unit has since been rebuilt with low short hood and repainted in the horsehead scheme. 3300 EMD SD40-2 SD40-2 Unit has since been rebuilt with low short hood and repainted in the horsehead scheme. 3301 EMD SD40-2 SD40-2 Unit has since been rebuilt with low short hood and repainted in the horsehead scheme. 3302 EMD SD40-2 SD40-2 Unit has since been rebuilt with low short hood and repainted in the horsehead scheme. 3303 EMD SD40-2 SD40-2 Unit has since been rebuilt with low short hood and repainted in the horsehead scheme. 3304 EMD SD40-2 SD40-2 Unit has since been rebuilt with low short hood and repainted in the horsehead scheme. 3305 EMD SD40-2 SD40-2 Unit has since been rebuilt with low short hood and repainted in the horsehead scheme. 3306 EMD SD40-2 SD40-2 Unit has since been rebuilt with low short hood and repainted in the horsehead scheme. 3307 EMD SD40-2 SD40-2 Unit has since been rebuilt with low short hood and repainted in the horsehead scheme. 3308 EMD SD40-2 SD40-2 Unit has since been rebuilt with low short hood and repainted in the horsehead scheme. 3309 EMD SD40-2 SD40-2 Unit has since been rebuilt with low short hood and repainted in the horsehead scheme. 3310 EMD SD40-2 SD40-2 Unit has since been rebuilt with low short hood and repainted in the horsehead scheme. 3311 EMD SD40-2 SD40-2 Unit has since been rebuilt with low short hood and repainted in the horsehead scheme. 3312 EMD SD40-2 SD40-2 Unit has since been rebuilt with low short hood and repainted in the horsehead scheme. 3313 EMD SD40-2 SD40-2 Unit has since been rebuilt with low short hood and repainted in the horsehead scheme. 3314 EMD SD40-2 SD40-2 Unit has since been rebuilt with low short hood and repainted in the horsehead scheme. 3315 EMD SD40-2 SD40-2 Unit has since been rebuilt with low short hood and repainted in the horsehead scheme. 3316 EMD SD40-2 SD40-2 Unit has since been rebuilt with low short hood and repainted in the horsehead scheme. 3317 EMD SD40-2 SD40-2 Unit has since been rebuilt with low short hood and repainted in the horsehead scheme. 3318 EMD SD40-2 SD40-2 Unit has since been rebuilt with low short hood and repainted in the horsehead scheme. 3319 EMD SD40-2 SD40-2 Unit has since been rebuilt with low short hood and repainted in the horsehead scheme. 3320 EMD SD40-2 SD40-2 Unit has since been rebuilt with low short hood and repainted in the horsehead scheme. 3321 EMD SD40-2 SD40-2 Unit has since been rebuilt with low short hood and repainted in the horsehead scheme. 3322 EMD SD40-2 SD40-2 Unit has since been rebuilt with low short hood and repainted in the horsehead scheme. 3323 EMD SD40-2 SD40-2 Unit has since been rebuilt with low short hood and repainted in the horsehead scheme. 3324 EMD SD40-2 SD40-2 Unit has since been rebuilt with low short hood and repainted in the horsehead scheme. 3325 EMD SD40-2 SD40-2 Unit has since been rebuilt with low short hood and repainted in the horsehead scheme. 3326 EMD SD40-2 SD40-2 Unit has since been rebuilt with low short hood and repainted in the horsehead scheme. 3327 EMD SD40-2 SD40-2 Unit has since been rebuilt with low short hood and repainted in the horsehead scheme. 3328 EMD SD40-2 SD40-2 Unit has since been rebuilt with low short hood and repainted in the horsehead scheme. 3331 EMD SD40-2 SD40-2 Former CR 6360. Unit has since been repainted in the horsehead scheme. 3344 EMD SD40-2 SD40-2 Former CR 6384. Unit has since been repainted in the horsehead scheme. 3346 EMD SD40-2 SD40-2 Former CR 6387. Unit has since been repainted in the horsehead scheme. 3368 EMD SD40-2 SD40-2 Former CR 6423. Unit has since been repainted in the horsehead scheme. 3394 EMD SD40-2 SD40-2 Former CR 6466. Unit has since been repainted in the horsehead scheme. 3414 EMD SD40-2 SD40-2 Former CR 6504. Unit has since been repainted in the horsehead scheme. 3522 GE Dash 8-32B D8-32B Unit renumbered to NS 522 in 10-2013. 3523 GE Dash 8-32B D8-32B Unit renumbered to NS 523 in 09-2013. 3524 GE Dash 8-32B D8-32B Unit renumbered to NS 524 in 09-2013. 3525 GE Dash 8-32B D8-32B Unit renumbered to NS 525 in 10-2013. 3526 GE Dash 8-32B D8-32B Unit renumbered to NS 526 in 10-2013. 3528 GE Dash 8-32B D8-32B Unit renumbered to NS 528 in 09-2013. 3530 GE Dash 8-32B D8-32B Unit renumbered to NS 530 in 09-2013. 3531 GE Dash 8-32B D8-32B Unit renumbered to NS 531 in 09-2013. 3532 GE Dash 8-32B D8-32B Unit renumbered to NS 532 in 09-2013. 3533 GE Dash 8-32B D8-32B Unit renumbered to NS 533 in 09-2013. 3534 GE Dash 8-32B D8-32B Unit renumbered to NS 534 in 09-2013. 3537 GE Dash 8-32B D8-32B Unit renumbered to NS 537 in 10-2013. 3538 GE Dash 8-32B D8-32B Unit renumbered to NS 538 in 09-2013. 3539 GE Dash 8-32B D8-32B Unit renumbered to NS 539 in 09-2013. 3540 GE Dash 8-32B D8-32B Unit renumbered to NS 540 in 09-2013. 3542 GE Dash 8-32B D8-32B Unit renumbered to NS 542 in 09-2013. 3543 GE Dash 8-32B D8-32B Unit renumbered to NS 543 in 10-2013. 3545 GE Dash 8-32B D8-32B Unit renumbered to NS 545 in 09-2013. 3546 GE Dash 8-32B D8-32B Unit renumbered to NS 546 in 10-2013. 3548 GE Dash 8-32B D8-32B Unit renumbered to NS 548 in 09-2013. 3549 GE Dash 8-32B D8-32B Unit renumbered to NS 549 in 09-2013. 3550 GE Dash 8-32B D8-32B Unit renumbered to NS 550 in 10-2013. 3551 GE Dash 8-32B D8-32B Unit renumbered to NS 551 in 09-2013. 3552 GE Dash 8-32B D8-32B Unit renumbered to NS 552 in 10-2013. 3554 GE Dash 8-32B D8-32B Unit renumbered to NS 554 in 09-2013. 3556 GE Dash 8-32B D8-32B Unit renumbered to NS 556 in 10-2013. 3557 GE Dash 8-32B D8-32B Unit renumbered to NS 557 in 09-2013. 3558 GE Dash 8-32B D8-32B Unit renumbered to NS 558 in 09-2013. 3559 GE Dash 8-32B D8-32B Unit renumbered to NS 559 in 10-2013. 3560 GE Dash 8-32B D8-32B Unit renumbered to NS 560 in 10-2013. 3561 GE Dash 8-32B D8-32B Unit renumbered to NS 561 in 09-2013. 3562 GE Dash 8-32B D8-32B Unit renumbered to NS 562 in 10-2013. 3563 GE Dash 8-32B D8-32B Unit has been retired. 3565 GE Dash 8-32B D8-32B Unit renumbered to NS 565 in 09-2013. 3807 EMD SD38 SD38 Former CR/PC 6935. Unit has been retired. 4105 EMD GP38AC GP38AC Unit has been retired. 4106 EMD GP38AC GP38AC Unit has since been rebuilt to a NS GP40-2. 4117 EMD GP38AC GP38AC Unit has been retired. 4122 EMD GP38AC GP38AC Unit has been retired. 4123 EMD GP38AC GP38AC Unit has been retired. 4124 EMD GP38AC GP38AC Unit has been retired. 4131 EMD GP38AC GP38AC Unit has been retired. 4132 EMD GP38AC GP38AC Unit has been retired. 4133 EMD GP38AC GP38AC Unit has since been rebuilt to a NS GP40-2. 4134 EMD GP38AC GP38AC Unit has since been rebuilt to a NS GP38-2. 4135 EMD GP38AC GP38AC Unit has since been rebuilt to a NS GP38-2. 4136 EMD GP38AC GP38AC Unit has been retired. 4138 EMD GP38AC GP38AC Unit has since been rebuilt to a NS GP38-2. 4142 EMD GP38AC GP38AC Unit has been retired. 4144 EMD GP38AC GP38AC Unit has been retired. 4148 EMD GP38AC GP38AC Unit has been retired. 4150 EMD GP38AC GP38AC Unit has been retired. 4154 EMD GP38AC GP38AC Unit has been retired. 4155 EMD GP38AC GP38AC Unit has been retired. 4158 EMD GP38AC GP38AC Unit has been retired. 4606 EMD GP59 GP59 Former EMD demo 8. Unit has since been rebuilt to a GP59E. 4608 EMD GP59 GP59 Former EMD demo 10. Unit has since been rebuilt to a GP59E. 4611 EMD GP59 GP59 Was painted in special TRANSCAER scheme. Unit has since been rebuilt to a GP59ECO. 4620 EMD GP59 GP59 Unit has since been rebuilt to a GP59E. 4629 EMD GP59 GP59 Was painted in special Operation Lifesaver scheme. Unit has since been rebuilt to a GP59ECO. 4632 EMD GP59 GP59 Was painted in special Operation Lifesaver scheme. Unit has since been rebuilt to a GP59E. 4633 EMD GP59 GP59 Was painted in special Operation Lifesaver scheme. Unit has since been rebuilt to a GP59ECO. 4635 EMD GP59 GP59 Painted in special Operation Lifesaver scheme. 4639 EMD GP59 GP59 Painted in special Operation Lifesaver scheme. 4641 EMD GP59 GP59 Was painted in special Operation Lifesaver scheme. Unit has since been rebuilt to a GP59ECO. 5000 EMD GP38-2 GP38-2 Unit has since been repainted in the horsehead scheme. 5001 EMD GP38-2 GP38-2 Unit has since been repainted in the horsehead scheme. 5004 EMD GP38-2 GP38-2 Unit has since been repainted in the horsehead scheme. 5006 EMD GP38-2 GP38-2 Unit has since been repainted in the horsehead scheme. 5007 EMD GP38-2 GP38-2 Unit has since been repainted in the horsehead scheme. 5008 EMD GP38-2 GP38-2 Unit has since been repainted in the horsehead scheme. 5009 EMD GP38-2 GP38-2 Unit has since been repainted in the horsehead scheme. 5010 EMD GP38-2 GP38-2 Unit has since been repainted in the horsehead scheme. 5011 EMD GP38-2 GP38-2 Unit has since been repainted in the horsehead scheme. 5014 EMD GP38-2 GP38-2 Unit has since been repainted in the horsehead scheme. 5015 EMD GP38-2 GP38-2 Unit has since been repainted in the horsehead scheme. 5017 EMD GP38-2 GP38-2 Unit has since been repainted in the horsehead scheme. 5020 EMD GP38-2 GP38-2 Unit has since been repainted in the horsehead scheme. 5023 EMD GP38-2 GP38-2 Unit has been retired. 5024 EMD GP38-2 GP38-2 Unit has since been repainted in the horsehead scheme. 5025 EMD GP38-2 GP38-2 Unit has since been repainted in the horsehead scheme. 5028 EMD GP38-2 GP38-2 Unit has since been repainted in the horsehead scheme. 5029 EMD GP38-2 GP38-2 Unit has since been repainted in the horsehead scheme. 5030 EMD GP38-2 GP38-2 Unit has since been repainted in the horsehead scheme. 5032 EMD GP38-2 GP38-2 Unit has since been repainted in the horsehead scheme. 5034 EMD GP38-2 GP38-2 Unit has since been repainted in the horsehead scheme. 5035 EMD GP38-2 GP38-2 Unit has since been repainted in the horsehead scheme. 5037 EMD GP38-2 GP38-2 Unit has since been repainted in the horsehead scheme. 5039 EMD GP38-2 GP38-2 Unit has since been repainted in the horsehead scheme. 5040 EMD GP38-2 GP38-2 Unit has since been repainted in the horsehead scheme. 5041 EMD GP38-2 GP38-2 Unit has since been repainted in the horsehead scheme. 5042 EMD GP38-2 GP38-2 Unit has since been repainted in the horsehead scheme. 5043 EMD GP38-2 GP38-2 Unit has since been repainted in the horsehead scheme. 5044 EMD GP38-2 GP38-2 Unit has since been repainted in the horsehead scheme. 5045 EMD GP38-2 GP38-2 Unit has since been repainted in the horsehead scheme. 5046 EMD GP38-2 GP38-2 Unit has since been repainted in the horsehead scheme. 5047 EMD GP38-2 GP38-2 Unit has since been repainted in the horsehead scheme. 5048 EMD GP38-2 GP38-2 Unit has since been repainted in the horsehead scheme. 5049 EMD GP38-2 GP38-2 Unit has since been repainted in the horsehead scheme. 5050 EMD GP38-2 GP38-2 Unit has since been repainted in the horsehead scheme. 5051 EMD GP38-2 GP38-2 Unit has since been repainted in the horsehead scheme. 5053 EMD GP38-2 GP38-2 Unit has since been rebuilt with low short hood and repainted in the horsehead scheme. 5054 EMD GP38-2 GP38-2 Unit has since been rebuilt with low short hood and repainted in the horsehead scheme. 5055 EMD GP38-2 GP38-2 Unit has since been repainted in the horsehead scheme. 5056 EMD GP38-2 GP38-2 Unit has since been repainted in the horsehead scheme. 5058 EMD GP38-2 GP38-2 Unit has since been repainted in the horsehead scheme. 5059 EMD GP38-2 GP38-2 Unit has been retired. 5060 EMD GP38-2 GP38-2 Unit has been retired. 5061 EMD GP38-2 GP38-2 Unit has been retired. 5062 EMD GP38-2 GP38-2 Unit has since been rebuilt with low short hood and repainted in the horsehead scheme. 5063 EMD GP38-2 GP38-2 Unit has been retired. 5064 EMD GP38-2 GP38-2 Unit has been retired. 5065 EMD GP38-2 GP38-2 Unit has been retired. 5066 EMD GP38-2 GP38-2 Unit has since been rebuilt with low short hood and repainted in the horsehead scheme. 5067 EMD GP38-2 GP38-2 Unit has been retired. 5069 EMD GP38-2 GP38-2 Unit has been retired. 5070 EMD GP38-2 GP38-2 Unit has since been rebuilt with low short hood and repainted in the horsehead scheme. 5071 EMD GP38-2 GP38-2 Unit has been retired. 5072 EMD GP38-2 GP38-2 Unit has been retired. 5073 EMD GP38-2 GP38-2 Unit has since been rebuilt with low short hood and repainted in the horsehead scheme. 5074 EMD GP38-2 GP38-2 Unit has since been rebuilt with low short hood and repainted in the horsehead scheme. 5075 EMD GP38-2 GP38-2 Unit has been retired. 5076 EMD GP38-2 GP38-2 Unit has been retired. 5077 EMD GP38-2 GP38-2 Unit has since been rebuilt with low short hood and repainted in the horsehead scheme. 5078 EMD GP38-2 GP38-2 Unit has been retired. 5079 EMD GP38-2 GP38-2 Unit has since been rebuilt with low short hood and repainted in the horsehead scheme. 5080 EMD GP38-2 GP38-2 Unit has been retired. 5081 EMD GP38-2 GP38-2 Unit has been retired. 5082 EMD GP38-2 GP38-2 Unit has been retired. 5083 EMD GP38-2 GP38-2 Unit has been retired. 5085 EMD GP38-2 GP38-2 Unit has been retired. 5086 EMD GP38-2 GP38-2 Unit has been retired. 5088 EMD GP38-2 GP38-2 Unit has been retired. 5089 EMD GP38-2 GP38-2 Unit has been retired. 5090 EMD GP38-2 GP38-2 Unit has been retired. 5091 EMD GP38-2 GP38-2 Unit has been retired. 5092 EMD GP38-2 GP38-2 Unit has since been rebuilt with low short hood and repainted in the horsehead scheme. 5093 EMD GP38-2 GP38-2 Unit has been retired. 5094 EMD GP38-2 GP38-2 Unit has since been repainted in the horsehead scheme. 5096 EMD GP38-2 GP38-2 Unit has been retired. 5098 EMD GP38-2 GP38-2 Unit has been retired. 5099 EMD GP38-2 GP38-2 Unit has been retired. 5100 EMD GP38-2 GP38-2 Unit has been retired. 5101 EMD GP38-2 GP38-2 Unit has since been rebuilt with low short hood and repainted in the horsehead scheme. 5102 EMD GP38-2 GP38-2 Unit has been retired. 5103 EMD GP38-2 GP38-2 Unit has been retired. 5106 EMD GP38-2 GP38-2 Unit has been retired. 5107 EMD GP38-2 GP38-2 Unit has been retired. 5108 EMD GP38-2 GP38-2 Unit has been retired. 5109 EMD GP38-2 GP38-2 Unit has been retired. 5110 EMD GP38-2 GP38-2 Unit has been retired. 5111 EMD GP38-2 GP38-2 Unit has been retired. 5112 EMD GP38-2 GP38-2 Unit has been retired. 5113 EMD GP38-2 GP38-2 Unit has since been rebuilt with low short hood and repainted in the horsehead scheme. 5114 EMD GP38-2 GP38-2 Unit has been retired. 5115 EMD GP38-2 GP38-2 Unit has been retired. 5116 EMD GP38-2 GP38-2 Unit has since been rebuilt with low short hood and repainted in the horsehead scheme. 5117 EMD GP38-2 GP38-2 Unit has been retired. 5118 EMD GP38-2 GP38-2 Unit has been retired. 5119 EMD GP38-2 GP38-2 Unit has been retired. 5121 EMD GP38-2 GP38-2 Unit has been retired. 5122 EMD GP38-2 GP38-2 Unit has been retired. 5123 EMD GP38-2 GP38-2 Unit has been retired. 5124 EMD GP38-2 GP38-2 Unit has been retired. 5125 EMD GP38-2 GP38-2 Unit has since been rebuilt with low short hood and repainted in the horsehead scheme. 5126 EMD GP38-2 GP38-2 Unit has since been rebuilt with low short hood and repainted in the horsehead scheme. 5127 EMD GP38-2 GP38-2 Unit has been retired. 5128 EMD GP38-2 GP38-2 Unit has been retired. 5129 EMD GP38-2 GP38-2 Unit has been retired. 5131 EMD GP38-2 GP38-2 Unit has since been rebuilt with low short hood and repainted in the horsehead scheme. 5132 EMD GP38-2 GP38-2 Unit has since been rebuilt with low short hood and repainted in the horsehead scheme. 5134 EMD GP38-2 GP38-2 Unit has been retired. 5135 EMD GP38-2 GP38-2 Unit has since been rebuilt with low short hood and repainted in the horsehead scheme. 5136 EMD GP38-2 GP38-2 Unit has been retired. 5137 EMD GP38-2 GP38-2 Unit has been retired. 5138 EMD GP38-2 GP38-2 Unit has since been repainted in the horsehead scheme. 5139 EMD GP38-2 GP38-2 Unit has been retired. 5140 EMD GP38-2 GP38-2 Unit has since been rebuilt with low short hood and repainted in the horsehead scheme. 5141 EMD GP38-2 GP38-2 Unit has since been repainted in the horsehead scheme. 5142 EMD GP38-2 GP38-2 Unit has been retired. 5143 EMD GP38-2 GP38-2 Unit has been retired. 5145 EMD GP38-2 GP38-2 Unit has been retired. 5147 EMD GP38-2 GP38-2 Unit has since been rebuilt with low short hood and repainted in the horsehead scheme. 5148 EMD GP38-2 GP38-2 Unit has been retired. 5150 EMD GP38-2 GP38-2 Unit has been retired. 5152 EMD GP38-2 GP38-2 Unit has been retired. 5153 EMD GP38-2 GP38-2 Unit has been retired. 5154 EMD GP38-2 GP38-2 Unit has been retired. 5156 EMD GP38-2 GP38-2 Unit has been retired. 5157 EMD GP38-2 GP38-2 Unit has since been rebuilt with low short hood and repainted in the horsehead scheme. 5158 EMD GP38-2 GP38-2 Unit has since been repainted in the horsehead scheme. 5160 EMD GP38-2 GP38-2 Unit has been retired. 5161 EMD GP38-2 GP38-2 Unit has been retired. 5162 EMD GP38-2 GP38-2 Unit has been retired. 5165 EMD GP38-2 GP38-2 Unit has since been rebuilt with low short hood and repainted in the horsehead scheme. 5166 EMD GP38-2 GP38-2 Unit has been retired. 5168 EMD GP38-2 GP38-2 Unit has since been repainted in the horsehead scheme. 5169 EMD GP38-2 GP38-2 Unit has been retired. 5171 EMD GP38-2 GP38-2 Unit has been retired. 5174 EMD GP38-2 GP38-2 Unit has since been rebuilt with low short hood and repainted in the horsehead scheme. 5175 EMD GP38-2 GP38-2 Unit has been retired. 5176 EMD GP38-2 GP38-2 Unit has since been rebuilt with low short hood and repainted in the horsehead scheme. 5177 EMD GP38-2 GP38-2 Unit has since been rebuilt with low short hood and repainted in the horsehead scheme. 5179 EMD GP38-2 GP38-2 Unit has since been rebuilt with low short hood and repainted in the horsehead scheme. 5180 EMD GP38-2 GP38-2 Unit has been retired. 5181 EMD GP38-2 GP38-2 Unit has since been rebuilt with low short hood and repainted in the horsehead scheme. 5182 EMD GP38-2 GP38-2 Unit has since been repainted in the horsehead scheme. 5183 EMD GP38-2 GP38-2 Unit has since been repainted in the horsehead scheme. 5184 EMD GP38-2 GP38-2 Unit has been retired. 5185 EMD GP38-2 GP38-2 Unit has been retired. 5187 EMD GP38-2 GP38-2 Unit has been retired. 5188 EMD GP38-2 GP38-2 Unit has been retired. 5189 EMD GP38-2 GP38-2 Unit has since been rebuilt with low short hood and repainted in the horsehead scheme. 5193 EMD GP38-2 GP38-2 Unit has since been rebuilt with low short hood and repainted in the horsehead scheme. 5242 EMD GP38-2 GP38-2 Unit has since been repainted in the horsehead scheme. 5245 EMD GP38-2 GP38-2 Unit has since been repainted in the horsehead scheme. 5254 EMD GP38-2 GP38-2 Unit has since been rebuilt with low short hood and repainted in the horsehead scheme. 5255 EMD GP38-2 GP38-2 Unit has since been repainted in the horsehead scheme. 5256 EMD GP38-2 GP38-2 Unit has since been repainted in the horsehead scheme. 5507 EMD/NS GP38-2 GP38-2 Rebuilt from NS/NW GP38AC 4118. Unit has been retired. 5512 EMD/NS GP38-2 GP38-2 Rebuilt from NS/NW GP38AC 4101. Unit has been retired. 5515 EMD GP38-2 GP38-2 Rebuilt from NS/SOU GP38 2861. Unit has been retired. 5518 EMD GP38-2 GP38-2 Rebuilt from NS/SOU GP38 2759. Unit has been retired. 5519 EMD GP38-2 GP38-2 Rebuilt from NS/SOU GP38 2822. Unit has been retired. 5520 EMD GP38-2 GP38-2 Rebuilt from NS/NW GP38AC 4140. Unit has been retired. 5524 EMD/NS GP38-2 GP38-2 Rebuilt from NS/SOU GP38 2798. Unit has been retired. 5525 EMD/NS GP38-2 GP38-2 Rebuilt from NS/SOU GP38AC 2825. Unit has been retired. 5532 EMD/NS GP38-2 GP38-2 Rebuilt from NS/SOU GP38 2759. Unit has been retired. 5542 EMD/NS GP38-2 GP38-2 Rebuilt from NS/SOU GP38 2738. Unit has been retired. 5548 EMD/NS GP38-2 GP38-2 Rebuilt from NS/SOU GP38 2819. Unit has been retired. 5549 EMD/NS GP38-2 GP38-2 Rebuilt from NS/SOU GP38 2794. Unit has been retired. 5551 EMD/NS GP38-2 GP38-2 Rebuilt from NS/SOU GP38 2727. Unit has been retired. 5552 EMD/NS GP38-2 GP38-2 Rebuilt from NS/SOU GP38AC 2859. Unit has been retired. 5557 EMD/NS GP38-2 GP38-2 Rebuilt from NS/NW GP38AC 4156. Unit has been retired. 5558 EMD/NS GP38-2 GP38-2 Rebuilt from NS/SOU GP38 2808. Unit has been retired. 5559 EMD/NS GP38-2 GP38-2 Rebuilt from NS/SOU GP38AC 2836. Unit has been retired. 6073 EMD SD40-2 SD40-2 Unit has since been repainted in the horsehead scheme. 6074 EMD SD40-2 SD40-2 Unit has since been repainted in the horsehead scheme. 6075 EMD SD40-2 SD40-2 Unit has since been repainted in the horsehead scheme. 6077 EMD SD40-2 SD40-2 Unit has since been repainted in the horsehead scheme. 6079 EMD SD40-2 SD40-2 Unit has since been repainted in the horsehead scheme. 6080 EMD SD40-2 SD40-2 Unit has since been repainted in the horsehead scheme. 6081 EMD SD40-2 SD40-2 Unit has since been repainted in the horsehead scheme. 6083 EMD SD40-2 SD40-2 Unit has since been repainted in the horsehead scheme. 6085 EMD SD40-2 SD40-2 Unit has since been repainted in the horsehead scheme. 6086 EMD SD40-2 SD40-2 Unit has since been repainted in the horsehead scheme. 6087 EMD SD40-2 SD40-2 Unit has since been repainted in the horsehead scheme. 6088 EMD SD40-2 SD40-2 Unit has since been repainted in the horsehead scheme. 6089 EMD SD40-2 SD40-2 Unit has since been repainted in the horsehead scheme. 6090 EMD SD40-2 SD40-2 Unit has since been repainted in the horsehead scheme. 6091 EMD SD40-2 SD40-2 Unit has since been repainted in the horsehead scheme. 6093 EMD SD40-2 SD40-2 Unit has since been repainted in the horsehead scheme. 6094 EMD SD40-2 SD40-2 Unit has since been repainted in the horsehead scheme. 6096 EMD SD40-2 SD40-2 Unit has since been repainted in the horsehead scheme. 6097 EMD SD40-2 SD40-2 Unit has since been repainted in the horsehead scheme. 6098 EMD SD40-2 SD40-2 Unit has since been repainted in the horsehead scheme. 6099 EMD SD40-2 SD40-2 Unit has since been repainted in the horsehead scheme. 6100 EMD SD40-2 SD40-2 Unit has since been repainted in the horsehead scheme. 6101 EMD SD40-2 SD40-2 Unit has since been repainted in the horsehead scheme. 6102 EMD SD40-2 SD40-2 Unit has since been repainted in the horsehead scheme. 6103 EMD SD40-2 SD40-2 Unit has since been repainted in the horsehead scheme. 6105 EMD SD40-2 SD40-2 Unit has since been repainted in the horsehead scheme. 6106 EMD SD40-2 SD40-2 Unit has since been repainted in the horsehead scheme. 6107 EMD SD40-2 SD40-2 Unit has since been repainted in the horsehead scheme. 6108 EMD SD40-2 SD40-2 Unit has since been repainted in the horsehead scheme. 6109 EMD SD40-2 SD40-2 Unit has since been repainted in the horsehead scheme. 6110 EMD SD40-2 SD40-2 Unit has since been repainted in the horsehead scheme. 6111 EMD SD40-2 SD40-2 Unit has since been repainted in the horsehead scheme. 6112 EMD SD40-2 SD40-2 Unit has since been repainted in the horsehead scheme. 6113 EMD SD40-2 SD40-2 Unit has since been repainted in the horsehead scheme. 6114 EMD SD40-2 SD40-2 Unit has since been repainted in the horsehead scheme. 6115 EMD SD40-2 SD40-2 Unit has since been repainted in the horsehead scheme. 6116 EMD SD40-2 SD40-2 Unit has since been repainted in the horsehead scheme. 6117 EMD SD40-2 SD40-2 Unit has since been repainted in the horsehead scheme. 6118 EMD SD40-2 SD40-2 Unit has since been repainted in the horsehead scheme. 6121 EMD SD40-2 SD40-2 Unit has since been repainted in the horsehead scheme. 6122 EMD SD40-2 SD40-2 Unit has since been repainted in the horsehead scheme. 6123 EMD SD40-2 SD40-2 Unit has since been repainted in the horsehead scheme. 6124 EMD SD40-2 SD40-2 Unit has since been repainted in the horsehead scheme. 6125 EMD SD40-2 SD40-2 Unit has since been repainted in the horsehead scheme. 6126 EMD SD40-2 SD40-2 Unit has since been repainted in the horsehead scheme. 6127 EMD SD40-2 SD40-2 Unit has since been repainted in the horsehead scheme. 6129 EMD SD40-2 SD40-2 Unit has since been repainted in the horsehead scheme. 6130 EMD SD40-2 SD40-2 Unit has since been repainted in the horsehead scheme. 6131 EMD SD40-2 SD40-2 Unit has since been repainted in the horsehead scheme. 6132 EMD SD40-2 SD40-2 Unit has since been repainted in the horsehead scheme. 6133 EMD SD40-2 SD40-2 Unit has since been repainted in the horsehead scheme. 6135 EMD SD40-2 SD40-2 Unit has since been repainted in the horsehead scheme. 6136 EMD SD40-2 SD40-2 Unit has since been repainted in the horsehead scheme. 6137 EMD SD40-2 SD40-2 Unit has since been repainted in the horsehead scheme. 6142 EMD SD40-2 SD40-2 Unit has since been repainted in the horsehead scheme. 6143 EMD SD40-2 SD40-2 Unit has since been repainted in the horsehead scheme. 6151 EMD SD40-2 SD40-2 Unit has since been repainted in the horsehead scheme. 6152 EMD SD40-2 SD40-2 Unit has since been repainted in the horsehead scheme. 6153 EMD SD40-2 SD40-2 Unit has since been repainted in the horsehead scheme. 6155 EMD SD40-2 SD40-2 Unit has since been repainted in the horsehead scheme. 6156 EMD SD40-2 SD40-2 Unit has since been repainted in the horsehead scheme. 6158 EMD SD40-2 SD40-2 Unit has since been repainted in the horsehead scheme. 6159 EMD SD40-2 SD40-2 Unit has since been repainted in the horsehead scheme. 6160 EMD SD40-2 SD40-2 Unit has since been repainted in the horsehead scheme. 6161 EMD SD40-2 SD40-2 Unit has since been repainted in the horsehead scheme. 6162 EMD SD40-2 SD40-2 Unit has since been repainted in the horsehead scheme. 6163 EMD SD40-2 SD40-2 Unit has since been repainted in the horsehead scheme. 6164 EMD SD40-2 SD40-2 Unit has since been repainted in the horsehead scheme. 6165 EMD SD40-2 SD40-2 Unit has since been repainted in the horsehead scheme. 6166 EMD SD40-2 SD40-2 Unit has since been repainted in the horsehead scheme. 6167 EMD SD40-2 SD40-2 Unit has since been repainted in the horsehead scheme. 6168 EMD SD40-2 SD40-2 Unit has since been repainted in the horsehead scheme. 6169 EMD SD40-2 SD40-2 Unit has since been repainted in the horsehead scheme. 6171 EMD SD40-2 SD40-2 Unit has since been repainted in the horsehead scheme. 6172 EMD SD40-2 SD40-2 Unit has since been repainted in the horsehead scheme. 6174 EMD SD40-2 SD40-2 Unit has since been repainted in the horsehead scheme. 6175 EMD SD40-2 SD40-2 Unit has since been repainted in the horsehead scheme. 6176 EMD SD40-2 SD40-2 Unit has since been repainted in the horsehead scheme. 6177 EMD SD40-2 SD40-2 Unit has since been repainted in the horsehead scheme. 6179 EMD SD40-2 SD40-2 Unit has since been repainted in the horsehead scheme. 6180 EMD SD40-2 SD40-2 Unit has since been repainted in the horsehead scheme. 6183 EMD SD40-2 SD40-2 Unit has since been repainted in the horsehead scheme. 6184 EMD SD40-2 SD40-2 Unit has since been repainted in the horsehead scheme. 6185 EMD SD40-2 SD40-2 Unit has since been repainted in the horsehead scheme. 6187 EMD SD40-2 SD40-2 Unit has since been repainted in the horsehead scheme. 6190 EMD SD40-2 SD40-2 Unit has since been repainted in the horsehead scheme. 6504 EMD SD50S SD50S Unit has since been rebuilt to an NS SD40E. 6506 EMD SD50 SD50 Unit has since been rebuilt to an NS SD40E. 6509 EMD SD50 SD50 Unit has since been rebuilt to an NS PR43C. 6513 EMD SD50 SD50 Unit has since been rebuilt to an NS SD40E. 6518 EMD SD50 SD50 Unit has since been rebuilt to an NS SD40E. 6519 EMD SD50 SD50 Unit has since been rebuilt to an NS SD40E. 6550 EMD SD60 SD60 Unit has since been rebuilt to an NS PR43C. 6551 EMD SD60 SD60 Unit has since been rebuilt to an NS PR43C. 6552 EMD SD60 SD60 Unit has since been rebuilt to an NS PR43C. 6553 EMD SD60 SD60 Unit has since been rebuilt to an NS PR43C. 6554 EMD SD60 SD60 Unit has since been rebuilt to an NS PR43C. 6555 EMD SD60 SD60 Unit has since been rebuilt to an NS PR43C. 6557 EMD SD60 SD60 Unit has since been rebuilt to an NS PR43C. 6558 EMD SD60 SD60 Unit has since been rebuilt to an NS SD60E. 6559 EMD SD60 SD60 Unit has since been rebuilt to an NS SD60E. 6560 EMD SD60 SD60 Unit has since been rebuilt to an NS SD60E. 6561 EMD SD60 SD60 Unit has since been rebuilt to an NS SD60E. 6562 EMD SD60 SD60 Unit has since been rebuilt to an NS SD60E. 6563 EMD SD60 SD60 Unit has since been rebuilt to an NS SD60E. 6564 EMD SD60 SD60 Unit has since been rebuilt to an NS SD60E. 6565 EMD SD60 SD60 Unit has since been rebuilt to an NS SD60E. 6566 EMD SD60 SD60 Unit has since been rebuilt to an NS SD60E. 6567 EMD SD60 SD60 Unit has since been rebuilt to an NS SD60E. 6568 EMD SD60 SD60 Unit has since been rebuilt to an NS SD60E. 6569 EMD SD60 SD60 Unit has since been rebuilt to an NS SD60E. 6570 EMD SD60 SD60 Unit has since been rebuilt to an NS SD60E. 6571 EMD SD60 SD60 Unit has since been rebuilt to an NS SD60E. 6572 EMD SD60 SD60 Unit has since been rebuilt to an NS PR43C. 6573 EMD SD60 SD60 Unit has since been rebuilt to an NS SD60E. 6574 EMD SD60 SD60 Unit has since been rebuilt to an NS SD60E. 6575 EMD SD60 SD60 Unit has been retired. 6576 EMD SD60 SD60 Unit has since been rebuilt to an NS SD60E. 6577 EMD SD60 SD60 Unit has since been rebuilt to an NS SD60E. 6578 EMD SD60 SD60 Unit has since been rebuilt to an NS SD60E. 6579 EMD SD60 SD60 Unit has since been rebuilt to an NS SD60E. 6580 EMD SD60 SD60 Unit has since been rebuilt to an NS SD60E. 6581 EMD SD60 SD60 Unit has since been rebuilt to an NS SD60E. 6582 EMD SD60 SD60 Unit has since been rebuilt to an NS SD60E. 6583 EMD SD60 SD60 Unit has since been rebuilt to an NS SD60E. 6584 EMD SD60 SD60 Unit has since been rebuilt to an NS SD60E. 6585 EMD SD60 SD60 Unit has since been rebuilt to an NS SD60E. 6586 EMD SD60 SD60 Unit was repainted in the horsehead scheme. Unit has since been rebuilt to an NS SD60E. 6588 EMD SD60 SD60 Unit has since been rebuilt to an NS SD60E. 6589 EMD SD60 SD60 Unit has since been rebuilt to an NS SD60E. 6590 EMD SD60 SD60 Unit has since been rebuilt to an NS SD60E. 6591 EMD SD60 SD60 Unit has since been rebuilt to an NS SD60E. 6592 EMD SD60 SD60 Unit was repainted in the horsehead scheme. Unit has since been rebuilt to an NS SD60E. 6594 EMD SD60 SD60 Unit has since been rebuilt to an NS SD60E. 6595 EMD SD60 SD60 Unit has since been repainted in the horsehead scheme. Unit has been retired. 6598 EMD SD60 SD60 Unit has since been rebuilt to an NS SD60E. 6599 EMD SD60 SD60 Unit has since been rebuilt to an NS SD60E. 6600 EMD SD60 SD60 Unit has since been rebuilt to an NS SD60E. 6601 EMD SD60 SD60 Unit has since been rebuilt to an NS SD60E. 6602 EMD SD60 SD60 Unit has been retired. 6603 EMD SD60 SD60 Unit has since been rebuilt to an NS SD60E. 6605 EMD SD60 SD60 Unit was repainted in the horsehead scheme. Unit has been retired. 6606 EMD SD60 SD60 Unit was repainted in the horsehead scheme. Unit has since been rebuilt to an NS SD60E. 6607 EMD SD60 SD60 Unit has since been rebuilt to an NS SD60E. 6608 EMD SD60 SD60 Unit has since been rebuilt to an NS SD60E. 6609 EMD SD60 SD60 Unit has since been rebuilt to an NS SD60E. 6610 EMD SD60 SD60 Unit has since been rebuilt to an NS SD60E. 6611 EMD SD60 SD60 Unit was repainted in the horsehead scheme. Unit has since been rebuilt to an NS SD60E. 6612 EMD SD60 SD60 Unit has since been rebuilt to an NS SD60E. 6613 EMD SD60 SD60 Unit was repainted in the horsehead scheme. Unit has since been rebuilt to an NS SD60E. 6614 EMD SD60 SD60 Unit has since been rebuilt to an NS SD60E. 6615 EMD SD60 SD60 Unit has since been rebuilt to an NS SD60E. 6616 EMD SD60 SD60 Unit has since been rebuilt to an NS SD60E. 6617 EMD SD60 SD60 Unit has been retired. 6618 EMD SD60 SD60 Unit has since been rebuilt to an NS SD60E. 6619 EMD SD60 SD60 Unit was repainted in the horsehead scheme. Unit has since been rebuilt to an NS SD60E. 6620 EMD SD60 SD60 Unit has since been rebuilt to an NS SD60E. 6621 EMD SD60 SD60 Unit has since been rebuilt to an NS PR43C. 6622 EMD SD60 SD60 Unit has been retired. 6623 EMD SD60 SD60 Unit has since been repainted in the horsehead scheme. 6624 EMD SD60 SD60 Unit was repainted in the horsehead scheme. Unit has since been rebuilt to an NS SD60E. 6625 EMD SD60 SD60 Unit has since been rebuilt to an NS SD60E. 6626 EMD SD60 SD60 Unit has since been repainted in the horsehead scheme. 6627 EMD SD60 SD60 Unit has been retired. 6630 EMD SD60 SD60 Unit has since been repainted in the horsehead scheme. 6631 EMD SD60 SD60 Unit has since been rebuilt to an NS SD60E. 6632 EMD SD60 SD60 Unit has been retired. 6633 EMD SD60 SD60 Unit has since been rebuilt to an NS SD60E. 6634 EMD SD60 SD60 Unit has since been rebuilt to an NS SD60E. 6635 EMD SD60 SD60 Unit has been retired. 6636 EMD SD60 SD60 Unit has since been rebuilt to an NS SD60E. 6637 EMD SD60 SD60 Unit was repainted in the horsehead scheme. Unit has since been rebuilt to an NS SD60E. 6638 EMD SD60 SD60 Unit has since been rebuilt to an NS SD60E. 6639 EMD SD60 SD60 Unit has since been rebuilt to an NS SD60E. 6640 EMD SD60 SD60 Unit has since been rebuilt to an NS SD60E. 6641 EMD SD60 SD60 Unit has since been rebuilt to an NS SD60E. 6642 EMD SD60 SD60 Unit has since been rebuilt to an NS SD60E. 6644 EMD SD60 SD60 Unit has since been rebuilt to an NS SD60E. 6645 EMD SD60 SD60 Unit has since been repainted in the horsehead scheme. 6646 EMD SD60 SD60 Unit has since been rebuilt to an NS SD60E. 6647 EMD SD60 SD60 Unit has since been repainted in the horsehead scheme. 6648 EMD SD60 SD60 Unit has since been repainted in the horsehead scheme. 6649 EMD SD60 SD60 Unit has since been repainted in the horsehead scheme. 6650 EMD SD60 SD60 Unit has since been rebuilt to an NS SD60E. 6651 EMD SD60 SD60 Unit has since been repainted in the horsehead scheme. 6652 EMD SD60 SD60 Unit has since been repainted in the horsehead scheme. 6654 EMD SD60 SD60 Unit has since been rebuilt to an NS SD60E. 6657 EMD SD60 SD60 Unit has since been rebuilt to an NS SD60E. 6660 EMD SD60 SD60 Unit has since been repainted in the horsehead scheme. 6664 EMD SD60 SD60 Unit has been retired. 6665 EMD SD60 SD60 Unit has since been rebuilt to an NS SD60E. 6666 EMD SD60 SD60 Unit has since been rebuilt to an NS SD60E. 6668 EMD SD60 SD60 Unit has since been repainted in the horsehead scheme. 6672 EMD SD60 SD60 Unit was repainted in the horsehead scheme. Unit has since been rebuilt to an NS SD60E. 6675 EMD SD60 SD60 Unit has since been rebuilt to an NS SD60E. 6676 EMD SD60 SD60 Unit has since been rebuilt to an NS SD60E. 6678 EMD SD60 SD60 Unit has since been rebuilt to an NS SD60E. 6679 EMD SD60 SD60 Unit has since been rebuilt to an NS SD60E. 6680 EMD SD60 SD60 Unit has since been rebuilt to an NS SD60E. 6681 EMD SD60 SD60 Unit has since been rebuilt to an NS SD60E. 6682 EMD SD60 SD60 Unit has been retired. 6683 EMD SD60 SD60 Unit has since been rebuilt to an NS SD60E. 6685 EMD SD60 SD60 Unit has since been rebuilt to an NS SD60E. 6686 EMD SD60 SD60 Unit has since been rebuilt to an NS SD60E. 6688 EMD SD60 SD60 Unit has since been rebuilt to an NS SD60E. 6689 EMD SD60 SD60 Unit has since been rebuilt to an NS SD60E. 6690 EMD SD60 SD60 Unit has been retired. 6693 EMD SD60 SD60 Unit has since been rebuilt to an NS SD60E. 6695 EMD SD60 SD60 Unit has been retired. 6696 EMD SD60 SD60 Unit has since been rebuilt to an NS SD60E. 6697 EMD SD60 SD60 Unit has since been rebuilt to an NS SD60E. 6699 EMD SD60 SD60 Unit has since been repainted in the horsehead scheme. 7003 EMD GP50 GP50 Unit has since been rebuilt to an NS RP-M4C Slug. 7004 EMD GP50 GP50 Unit has since been rebuilt to an NS GP33ECO. 7005 EMD GP50 GP50 Unit has since been rebuilt to an NS RP-E4C Slug. 7006 EMD GP50 GP50 Unit has since been rebuilt to an NS GP33ECO. 7007 EMD GP50 GP50 Unit has since been rebuilt to an NS GP33ECO. 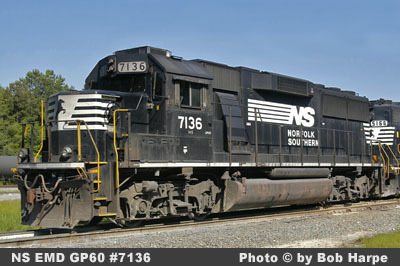 7009 EMD GP50 GP50 Unit has since been rebuilt to an NS GP38-3. 7010 EMD GP50 GP50 Unit has since been rebuilt to an NS GP33ECO. 7011 EMD GP50 GP50 Unit has since been rebuilt to an NS RP-E4C Slug. 7014 EMD GP50 GP50 Unit has since been rebuilt to an NS RP-M4C Slug. 7015 EMD GP50 GP50 Unit has since been rebuilt to an NS GP38-3. 7016 EMD GP50 GP50 Unit has since been rebuilt to an NS GP33ECO. 7017 EMD GP50 GP50 Unit has since been rebuilt to an NS RP-E4C Slug. 7018 EMD GP50 GP50 Unit has since been rebuilt to an NS GP33ECO. 7020 EMD GP50 GP50 Unit has since been rebuilt to an NS GP33ECO. 7021 EMD GP50 GP50 Unit has since been rebuilt to an NS GP33ECO. 7025 EMD GP50 GP50 Unit has since been rebuilt to an NS RP-E4C Slug. 7035 EMD GP50 GP50 Unit has since been rebuilt to an NS GP38-3. 7036 EMD GP50 GP50 Unit has since been rebuilt to an NS GP33ECO. 7038 EMD GP50 GP50 Unit has since been rebuilt to an NS RP-E4C Slug. 7040 EMD GP50 GP50 Unit has since been rebuilt to an NS GP33ECO. 7041 EMD GP50 GP50 Unit has since been rebuilt to an NS GP33ECO. 7044 EMD GP50 GP50 Unit has since been rebuilt to an NS RP-E4C Slug. 7045 EMD GP50 GP50 Unit has since been rebuilt to an NS RP-E4C Slug. 7046 EMD GP50 GP50 Unit has since been rebuilt to NS GP38-3. 7047 EMD GP50 GP50 Unit has since been rebuilt to an NS GP33ECO. 7048 EMD GP50 GP50 Unit has since been rebuilt to an NS GP33ECO. 7049 EMD GP50 GP50 Unit has since been rebuilt to NS GP38-3. 7051 EMD GP50 GP50 Unit has since been rebuilt to an NS GP33ECO. 7053 EMD GP50 GP50 Unit has since been rebuilt to an NS RP-E4C Slug. 7054 EMD GP50 GP50 Unit has since been rebuilt to an NS RP-E4C Slug. 7055 EMD GP50 GP50 Unit has since been rebuilt to an NS GP33ECO. 7058 EMD GP50 GP50 Unit has since been rebuilt to an NS GP33ECO. 7064 EMD GP50 GP50 Unit has since been rebuilt to an NS RP-E4C Slug. 7065 EMD GP50 GP50 Unit has since been rebuilt to an NS GP33ECO. 7066 EMD GP50 GP50 Unit has since been rebuilt to an NS GP33ECO. 7067 EMD GP50 GP50 Unit has since been rebuilt to an NS RP-E4C Slug. 7068 EMD GP50 GP50 Unit has since been rebuilt to an NS GP33ECO. 7069 EMD GP50 GP50 Unit has since been rebuilt to an NS GP33ECO. 7073 EMD GP50 GP50 Unit has since been rebuilt to an NS GP59ECO. 7074 EMD GP50 GP50 Unit has since been rebuilt to an NS GP33ECO. 7077 EMD GP50 GP50 Unit has since been rebuilt to an NS GP33ECO. 7078 EMD GP50 GP50 Unit has since been rebuilt to an NS RP-E4C Slug. 7081 EMD GP50 GP50 Unit has since been rebuilt to an NS GP33ECO. 7085 EMD GP50 GP50 Unit has since been rebuilt to an NS RP-E4C Slug. 7088 EMD GP50 GP50 Unit has since been rebuilt to an NS RP-E4C Slug. 7089 EMD GP50 GP50 Unit has since been rebuilt to NS GP38-3. 7090 EMD GP50 GP50 Unit has since been rebuilt to an NS RP-E4C Slug. 7091 EMD GP50 GP50 Unit has since been rebuilt to an NS GP33ECO. 7101 EMD GP60 GP60 Unit has since been repainted in the horsehead scheme. 7110 EMD GP60 GP60 Unit has since been repainted in the horsehead scheme. 7112 EMD GP60 GP60 Unit has since been repainted in the horsehead scheme. 7114 EMD GP60 GP60 Unit has since been repainted in the horsehead scheme. 7129 EMD GP60 GP60 Unit has since been repainted in the horsehead scheme. 7141 EMD GP60 GP60 Unit has since been repainted in the horsehead scheme. 8300 GE Dash 8-40C D8-40C Former CR 6026. Unit has been retired. 8302 GE Dash 8-40C D8-40C Former CR 6028. Unit has been retired. 8307 GE Dash 8-40C D8-40C Former CR 6035. Unit has since been rebuilt as an NS Dash 8.5-40CW. 8351 GE Dash 8-40CW D8-40CW Former CR 6112. Unit has since been repainted in the horsehead scheme. 8423 GE Dash 8-40CW D8-40CW Former CR 6236. Unit has been retired and scrapped. 8552 GE C39-8 C39-8 Unit has been retired. 8554 GE C39-8 C39-8 Unit has been retired. 8558 GE C39-8 C39-8 Unit has been retired. 8564 GE C39-8 C39-8 Unit has been retired. 8566 GE C39-8 C39-8 Unit has been retired. 8567 GE C39-8 C39-8 Unit has been retired. 8569 GE C39-8 C39-8 Unit has been retired. 8571 GE C39-8 C39-8 Unit has been retired. 8573 GE C39-8 C39-8 Unit has been retired. 8576 GE C39-8 C39-8 Unit has been retired. 8582 GE C39-8 C39-8 Unit has been retired. 8584 GE C39-8 C39-8 Unit has been retired. 8585 GE C39-8 C39-8 Unit has been retired. 8590 GE C39-8 C39-8 Unit has been retired. 8592 GE C39-8 C39-8 Unit has been retired. 8593 GE C39-8 C39-8 Unit has been retired. 8594 GE C39-8 C39-8 Unit has been retired. 8596 GE C39-8 C39-8 Unit has been retired. 8597 GE C39-8 C39-8 Unit has been retired. 8600 GE C39-8 C39-8 Unit has been retired. 8601 GE C39-8 C39-8 Unit has been retired. 8603 GE C39-8 C39-8 Unit has been retired. 8604 GE C39-8 C39-8 Unit has been retired. 8607 GE C39-8 C39-8 Unit has been retired. 8608 GE C39-8 C39-8 Unit has been retired. 8612 GE C39-8 C39-8 Unit has been retired. 8613 GE C39-8 C39-8 Unit has been retired. 8614 GE C39-8 C39-8 Unit has been retired. 8615 GE C39-8 C39-8 Unit has been retired. 8616 GE C39-8 C39-8 Unit has been retired. 8617 GE C39-8 C39-8 Unit has been retired. 8620 GE C39-8 C39-8 Unit has been retired. 8632 GE C39-8 C39-8 Unit has been retired. 8636 GE C39-8 C39-8 Unit has been retired. 8637 GE C39-8 C39-8 Unit has been retired. 8638 GE C39-8 C39-8 Unit has been retired. 8646 GE C39-8 C39-8 Unit has been retired. 8648 GE C39-8 C39-8 Unit has been retired. 8652 GE C39-8 C39-8 Unit has been retired. 8655 GE C39-8 C39-8 Unit has been retired. 8662 GE C39-8 C39-8 Unit has been retired. 8664 GE C39-8E C39-8 Unit has been retired. 8665 GE C39-8E C39-8 Unit has been retired. 8666 GE C39-8E C39-8 Unit has been retired. 8667 GE C39-8E C39-8 Unit has been retired. 8668 GE C39-8E C39-8 Unit has been retired. 8669 GE C39-8E C39-8 Unit has been retired. 8670 GE C39-8E C39-8 Unit has been retired. 8671 GE C39-8E C39-8 Unit has been retired. 8673 GE C39-8E C39-8 Unit has been retired. 8675 GE C39-8E C39-8 Unit has been retired. 8677 GE C39-8E C39-8 Unit has been retired. 8678 GE C39-8E C39-8 Unit has been retired. 8681 GE C39-8E C39-8 Unit has been retired. 8682 GE C39-8E C39-8 Unit has been retired. 8683 GE C39-8E C39-8 Unit has been retired. 8684 GE C39-8E C39-8 Unit has been retired. 8686 GE C39-8E C39-8 Unit has been retired. 8687 GE C39-8E C39-8 Unit has been retired. 8688 GE C39-8E C39-8 Unit has been retired. 8689 GE Dash 8-40C D8-40C Unit has been retired. 8690 GE Dash 8-40C D8-40C Unit has since been repainted in the horsehead scheme and later rebuilt as a Dash 8.5 -40CW. 8691 GE Dash 8-40C D8-40C Unit has been retired. 8692 GE Dash 8-40C D8-40C Unit has been rebuilt as a Dash 8.5-40CW. 8693 GE Dash 8-40C D8-40C Unit has been retired. 8694 GE Dash 8-40C D8-40C Unit has been retired. 8695 GE Dash 8-40C D8-40C Unit has been retired. 8696 GE Dash 8-40C D8-40C Unit has been retired. 8698 GE Dash 8-40C D8-40C Unit has been retired. 8699 GE Dash 8-40C D8-40C Unit has been rebuilt as a Dash 8.5 -40CW. 8700 GE Dash 8-40C D8-40C Unit has been retired. 8701 GE Dash 8-40C D8-40C Unit has since been repainted in the horsehead scheme. 8702 GE Dash 8-40C D8-40C Unit has been retired. 8703 GE Dash 8-40C D8-40C Unit has been retired. 8704 GE Dash 8-40C D8-40C Unit has been retired. 8705 GE Dash 8-40C D8-40C Unit has been retired. 8706 GE Dash 8-40C D8-40C Unit had white cab roof. Unit has been retired. 8707 GE Dash 8-40C D8-40C Unit has been retired. 8708 GE Dash 8-40C D8-40C Unit has been rebuilt as a Dash 8.5 -40CW. 8709 GE Dash 8-40C D8-40C Unit has been retired. 8710 GE Dash 8-40C D8-40C Unit has been retired. 8711 GE Dash 8-40C D8-40C Unit has been retired. 8712 GE Dash 8-40C D8-40C Unit has been retired. 8713 GE Dash 8-40C D8-40C Unit has been retired. 8714 GE Dash 8-40C D8-40C Unit has been retired. 8715 GE Dash 8-40C D8-40C Unit has since been repainted in the horsehead scheme. 8716 GE Dash 8-40C D8-40C Unit has since been repainted in the horsehead scheme. 8717 GE Dash 8-40C D8-40C Unit has since been repainted in the horsehead scheme. 8719 GE Dash 8-40C D8-40C Unit has been retired. 8720 GE Dash 8-40C D8-40C Unit has been retired. 8721 GE Dash 8-40C D8-40C Unit has since been repainted in the horsehead scheme. 8722 GE Dash 8-40C D8-40C Unit has been retired. 8723 GE Dash 8-40C D8-40C Unit has been retired. 8724 GE Dash 8-40C D8-40C Unit has been retired. 8725 GE Dash 8-40C D8-40C Unit has been retired. 8726 GE Dash 8-40C D8-40C Unit has since been repainted in the horsehead scheme. 8727 GE Dash 8-40C D8-40C Unit has since been repainted in the horsehead scheme. 8728 GE Dash 8-40C D8-40C Unit has since been repainted in the horsehead scheme. 8729 GE Dash 8-40C D8-40C Unit was wrecked and retired. 8730 GE Dash 8-40C D8-40C Unit has been retired. 8731 GE Dash 8-40C D8-40C Unit has been retired. 8732 GE Dash 8-40C D8-40C Unit has been retired. 8733 GE Dash 8-40C D8-40C Unit has been retired. 8734 GE Dash 8-40C D8-40C Unit has since been repainted in the horsehead scheme. 8737 GE Dash 8-40C D8-40C Unit has been rebuilt as a Dash 8.5 -40CW. 8738 GE Dash 8-40C D8-40C Unit has since been repainted in the horsehead scheme. 8739 GE Dash 8-40C D8-40C Unit has since been repainted in the horsehead scheme. 8740 GE Dash 8-40C D8-40C Unit has since been repainted in the horsehead scheme. 8741 GE Dash 8-40C D8-40C Unit has been retired. 8743 GE Dash 8-40C D8-40C Unit has been retired. 8744 GE Dash 8-40C D8-40C Unit has been retired. 8745 GE Dash 8-40C D8-40C Unit has been retired. 8747 GE Dash 8-40C D8-40C Unit has been retired. 8748 GE Dash 8-40C D8-40C Unit has been retired. 8749 GE Dash 8-40C D8-40C Unit has been retired. 8750 GE Dash 8-40C D8-40C Unit has been retired. 8752 GE Dash 8-40C D8-40C Unit has been retired. 8753 GE Dash 8-40C D8-40C Unit has been retired. 8754 GE Dash 8-40C D8-40C Unit has been retired. 8755 GE Dash 8-40C D8-40C Unit has been retired. 8756 GE Dash 8-40C D8-40C Unit has been retired. 8757 GE Dash 8-40C D8-40C Unit has since been repainted in the horsehead scheme. 8758 GE Dash 8-40C D8-40C Unit has been retired. 8759 GE Dash 8-40C D8-40C Unit has since been repainted in the horsehead scheme. 8760 GE Dash 8-40C D8-40C Unit has been retired. 8761 GE Dash 8-40C D8-40C Unit has since been repainted in the horsehead scheme. 8762 GE Dash 8-40C D8-40C Unit has since been repainted in the horsehead scheme. 8763 GE Dash 8-40C D8-40C Unit has since been repainted in the horsehead scheme. 8764 GE Dash 9-40C D9-40C Unit has since been repainted in the horsehead scheme. 8765 GE Dash 9-40C D9-40C Unit has since been repainted in the horsehead scheme. 8766 GE Dash 9-40C D9-40C Unit has since been repainted in the horsehead scheme. 8767 GE Dash 9-40C D9-40C Unit has since been repainted in the horsehead scheme. 8768 GE Dash9-40C D9-40C Unit has since been repainted in the horsehead scheme. 8769 GE Dash 9-40C D9-40C Unit has since been repainted in the horsehead scheme. 8770 GE Dash 9-40C D9-40C Unit has since been repainted in the horsehead scheme. 8771 GE Dash 9-40C D9-40C Unit has since been repainted in the horsehead scheme. 8772 GE Dash 9-40C D9-40C Unit has since been repainted in the horsehead scheme. 8773 GE Dash 9-40C D9-40C Unit has since been repainted in the horsehead scheme. 8774 GE Dash 9-40C D9-40C Unit has since been repainted in the horsehead scheme. 8775 GE Dash 9-40C D9-40C Unit has since been repainted in the horsehead scheme. 8776 GE Dash 9-40C D9-40C Unit has since been repainted in the horsehead scheme. 8777 GE Dash 9-40C D9-40C Unit has since been repainted in the horsehead scheme. 8778 GE Dash 9-40C D9-40C Unit has since been repainted in the horsehead scheme. 8780 GE Dash 9-40C D9-40C Unit has since been repainted in the horsehead scheme. 8781 GE Dash 9-40C D9-40C Unit has since been repainted in the horsehead scheme. 8782 GE Dash 9-40C D9-40C Unit was repainted in the horsehead scheme, but has since been rebuilt as a AC44C6M. 8783 GE Dash 9-40C D9-40C Unit was repainted in the horsehead scheme, but has since been rebuilt as a AC44C6M. 8784 GE Dash 9-40C D9-40C Unit has since been repainted in the horsehead scheme. 8785 GE Dash 9-40C D9-40C Unit has since been repainted in the horsehead scheme. 8786 GE Dash 9-40C D9-40C Unit has since been repainted in the horsehead scheme. 8787 GE Dash 9-40C D9-40C Unit has since been repainted in the horsehead scheme. 8788 GE Dash 9-40C D9-40C Unit has since been repainted in the horsehead scheme. 8789 GE Dash 9-40C D9-40C Unit was repainted in the horsehead scheme, but has since been rebuilt as a AC44C6M. 8790 GE Dash 9-40C D9-40C Unit has since been repainted in the horsehead scheme. 8791 GE Dash 9-40C D9-40C Unit has since been repainted in the horsehead scheme. 8792 GE Dash 9-40C D9-40C Unit has since been repainted in the horsehead scheme. 8793 GE Dash 9-40C D9-40C Unit has since been repainted in the horsehead scheme. 8794 GE Dash 9-40C D9-40C Unit has since been repainted in the horsehead scheme. 8795 GE Dash 9-40C D9-40C Unit has since been repainted in the horsehead scheme. 8796 GE Dash 9-40C D9-40C Unit has since been repainted in the horsehead scheme. 8797 GE Dash 9-40C D9-40C Unit has since been repainted in the horsehead scheme. 8798 GE Dash 9-40C D9-40C Unit has since been repainted in the horsehead scheme. 8799 GE Dash 9-40C D9-40C Unit was repainted in the horsehead scheme, but has since been rebuilt as a AC44C6M. 8800 GE Dash 9-40C D9-40C Unit has since been repainted in the horsehead scheme. 8801 GE Dash 9-40C D9-40C Unit was repainted in the horsehead scheme, but has since been rebuilt as a AC44C6M. 8802 GE Dash 9-40C D9-40C Unit has since been repainted in the horsehead scheme. 8803 GE Dash 9-40C D9-40C Unit has since been repainted in the horsehead scheme. 8804 GE Dash 9-40C D9-40C Unit has since been repainted in the horsehead scheme. 8805 GE Dash 9-40C D9-40C Unit has since been repainted in the horsehead scheme. 8806 GE Dash 9-40C D9-40C Unit has since been repainted in the horsehead scheme. 8807 GE Dash 9-40C D9-40C Unit has since been repainted in the horsehead scheme. 8808 GE Dash 9-40C D9-40C Unit was repainted in the horsehead scheme, but has since been rebuilt as a AC44C6M. 8809 GE Dash 9-40C D9-40C Unit has since been repainted in the horsehead scheme. 8810 GE Dash 9-40C D9-40C Unit has since been repainted in the horsehead scheme. 8811 GE Dash 9-40C D9-40C Unit has since been repainted in the horsehead scheme. 8813 GE Dash 9-40C D9-40C Unit has since been repainted in the horsehead scheme. 8814 GE Dash 9-40C D9-40C Unit was repainted in the horsehead scheme, but has since been rebuilt as a AC44C6M. 8815 GE Dash 9-40C D9-40C Unit has since been repainted in the horsehead scheme. 8816 GE Dash 9-40C D9-40C Unit has since been repainted in the horsehead scheme. 8817 GE Dash 9-40C D9-40C Unit has since been repainted in the horsehead scheme. 8818 GE Dash 9-40C D9-40C Unit has since been repainted in the horsehead scheme. 8819 GE Dash 9-40C D9-40C Unit has since been repainted in the horsehead scheme. 8820 GE Dash 9-40C D9-40C Unit has since been repainted in the horsehead scheme. 8821 GE Dash 9-40C D9-40C Unit has since been repainted in the horsehead scheme. 8822 GE Dash 9-40C D9-40C Unit has since been repainted in the horsehead scheme. 8823 GE Dash 9-40C D9-40C Unit was repainted in the horsehead scheme, but has since been rebuilt as a AC44C6M. 8824 GE Dash 9-40C D9-40C Rebuilt as an NS AC44C6M. 8825 GE Dash 9-40C D9-40C Unit has since been repainted in the horsehead scheme. 8826 GE Dash 9-40C D9-40C Unit has since been repainted in the horsehead scheme. 8827 GE Dash 9-40C D9-40C Unit has since been repainted in the horsehead scheme. 8828 GE Dash 9-40C D9-40C Unit has since been repainted in the horsehead scheme. 8829 GE Dash 9-40C D9-40C Unit has since been repainted in the horsehead scheme. 8830 GE Dash 9-40C D9-40C Unit has since been repainted in the horsehead scheme. 8831 GE Dash 9-40C D9-40C Unit has since been repainted in the horsehead scheme. 8832 GE Dash 9-40C D9-40C Unit has since been repainted in the horsehead scheme. 8833 GE Dash 9-40C D9-40C Unit was repainted in the horsehead scheme, but has since been rebuilt as a AC44C6M. 8834 GE Dash 9-40C D9-40C Unit has since been repainted in the horsehead scheme. 8835 GE Dash 9-40C D9-40C Unit has since been repainted in the horsehead scheme. 8836 GE Dash 9-40C D9-40C Unit was repainted in the horsehead scheme, but has since been rebuilt as a AC44C6M. 8837 GE Dash 9-40C D9-40C Unit has since been repainted in the horsehead scheme. 8838 GE Dash 9-40C D9-40C Unit has since been repainted in the horsehead scheme. 8839 GE Dash 9-40C D9-40C Unit was repainted in the horsehead scheme, but has since been rebuilt as a AC44C6M. 8840 GE Dash 9-40C D9-40C Unit has since been repainted in the horsehead scheme. 8841 GE Dash 9-40C D9-40C Unit has since been repainted in the horsehead scheme. 8842 GE Dash 9-40C D9-40C Unit has since been repainted in the horsehead scheme. 8843 GE Dash 9-40C D9-40C Unit has since been repainted in the horsehead scheme. 8844 GE Dash 9-40C D9-40C Unit has since been repainted in the horsehead scheme. 8845 GE Dash 9-40C D9-40C Unit has since been repainted in the horsehead scheme. 8846 GE Dash 9-40C D9-40C Unit was repainted in the horsehead scheme, but has since been rebuilt as a AC44C6M. 8847 GE Dash 9-40C D9-40C Unit has since been repainted in the horsehead scheme. 8849 GE Dash 9-40C D9-40C Unit was repainted in the horsehead scheme, but has since been rebuilt as a AC44C6M. 8850 GE Dash 9-40C D9-40C Unit has since been repainted in the horsehead scheme. 8851 GE Dash 9-40C D9-40C Unit has since been repainted in the horsehead scheme. 8852 GE Dash 9-40C D9-40C Unit has since been repainted in the horsehead scheme. 8854 GE Dash 9-40C D9-40C Unit has since been repainted in the horsehead scheme. 8855 GE Dash 9-40C D9-40C Unit has since been repainted in the horsehead scheme. 8856 GE Dash 9-40C D9-40C Unit has since been repainted in the horsehead scheme. 8857 GE Dash 9-40C D9-40C Unit was repainted in the horsehead scheme, but has since been rebuilt as a AC44C6M. 8858 GE Dash 9-40C D9-40C Unit was repainted in the horsehead scheme, but has since been rebuilt as a AC44C6M. 8859 GE Dash 9-40C D9-40C Unit has since been repainted in the horsehead scheme. 8860 GE Dash 9-40C D9-40C Unit has since been repainted in the horsehead scheme. 8861 GE Dash 9-40C D9-40C Unit has since been repainted in the horsehead scheme. 8862 GE Dash 9-40C D9-40C Unit has since been repainted in the horsehead scheme. 8863 GE Dash 9-40C D9-40C Unit has since been repainted in the horsehead scheme. 8864 GE Dash 9-40C D9-40C Unit has since been repainted in the horsehead scheme. 8865 GE Dash 9-40C D9-40C Unit has since been repainted in the horsehead scheme. 8866 GE Dash 9-40C D9-40C Unit was repainted in the horsehead scheme, but has since been rebuilt as a AC44C6M. 8867 GE Dash 9-40C D9-40C Unit was repainted in the horsehead scheme, but has since been rebuilt as a AC44C6M. 8868 GE Dash 9-40C D9-40C Unit has since been repainted in the horsehead scheme. 8869 GE Dash 9-40C D9-40C Unit has since been repainted in the horsehead scheme. 8870 GE Dash 9-40C D9-40C Unit has since been repainted in the horsehead scheme. 8871 GE Dash 9-40C D9-40C Unit was repainted in the horsehead scheme, but has since been rebuilt as a AC44C6M. 8872 GE Dash 9-40C D9-40C Unit has since been repainted in the horsehead scheme. 8873 GE Dash 9-40C D9-40C Unit has since been repainted in the horsehead scheme. 8874 GE Dash 9-40C D9-40C Unit has since been repainted in the horsehead scheme. 8875 GE Dash 9-40C D9-40C Unit has since been repainted in the horsehead scheme. 8876 GE Dash 9-40C D9-40C Unit has since been repainted in the horsehead scheme. 8877 GE Dash 9-40C D9-40C Unit has since been repainted in the horsehead scheme. 8878 GE Dash 9-40C D9-40C Unit has since been repainted in the horsehead scheme. 8879 GE Dash 9-40C D9-40C Unit was repainted in the horsehead scheme, but has since been rebuilt as a AC44C6M. 8880 GE Dash 9-40C D9-40C Unit has since been repainted in the horsehead scheme. 8881 GE Dash 9-40C D9-40C Unit has since been repainted in the horsehead scheme. 8882 GE Dash 9-40C D9-40C Unit was repainted in the horsehead scheme, but has since been rebuilt as a AC44C6M. 8883 GE Dash 9-40C D9-40C Unit has since been repainted in the horsehead scheme. 8884 GE Dash 9-40C D9-40C Unit has since been repainted in the horsehead scheme. 8886 GE Dash 9-40C D9-40C Unit has since been repainted in the horsehead scheme. 8887 GE Dash 9-40C D9-40C Unit has since been repainted in the horsehead scheme. 8888 GE Dash 9-40C D9-40C Unit has since been repainted in the horsehead scheme. 8889 GE Dash 9-44CW D9-44CW Unit has since been repainted in the horsehead scheme. 8890 GE Dash 9-44CW D9-44CW Rebuilt as an NS AC44C6M. 8891 GE Dash 9-44CW D9-44CW Rebuilt as an NS AC44C6M. 8892 GE Dash 9-44CW D9-44CW Rebuilt as an NS AC44C6M. 8893 GE Dash 9-44CW D9-44CW Unit has been retired for rebuilding as an AC44C6M. 8894 GE Dash 9-44CW D9-44CW Unit has since been repainted in the horsehead scheme. 8895 GE Dash 9-44CW D9-44CW Unit has since been repainted in the horsehead scheme. 8896 GE Dash 9-44CW D9-44CW Rebuilt as an NS AC44C6M. 8898 GE Dash 9-44CW D9-44CW Unit has since been repainted in the horsehead scheme. 8899 GE Dash 9-44CW D9-44CW Unit has been retired for rebuilding as an AC44C6M. 8900 GE Dash 9-44CW D9-44CW Rebuilt as an NS AC44C6M. 8902 GE Dash 9-44CW D9-44CW Rebuilt as an NS AC44C6M. 8903 GE Dash 9-44CW D9-44CW Rebuilt as an NS AC44C6M. 8904 GE Dash 9-44CW D9-44CW Rebuilt as an NS AC44C6M. 8907 GE Dash 9-44CW D9-44CW Rebuilt as an NS AC44C6M. 8908 GE Dash 9-44CW D9-44CW Rebuilt as an NS AC44C6M. 8910 GE Dash 9-44CW D9-44CW Rebuilt as an NS AC44C6M. 8911 GE Dash 9-44CW D9-44CW Unit has since been repainted in the horsehead scheme. 8912 GE Dash 9-44CW D9-44CW Rebuilt as an NS AC44C6M. 8913 GE Dash 9-44CW D9-44CW Unit has been retired for rebuilding as an AC44C6M. 8914 GE Dash 9-44CW D9-44CW Rebuilt as an NS AC44C6M. 8915 GE Dash 9-44CW D9-44CW Unit has been retired for rebuilding as an AC44C6M. 8918 GE Dash 9-44CW D9-44CW Rebuilt as an NS AC44C6M. 8919 GE Dash 9-44CW D9-44CW Rebuilt as an NS AC44C6M. 8920 GE Dash 9-44CW D9-44CW Rebuilt as an NS AC44C6M. 8921 GE Dash 9-44CW D9-44CW Rebuilt as an NS AC44C6M. 8922 GE Dash 9-44CW D9-44CW Unit has since been repainted in the horsehead scheme. 8923 GE Dash 9-44CW D9-44CW Rebuilt as an NS AC44C6M. 8925 GE Dash 9-44CW D9-44CW Unit has since been repainted in the horsehead scheme. 8927 GE Dash 9-44CW D9-44CW Unit has since been repainted in the horsehead scheme. 8928 GE Dash 9-44CW D9-44CW Rebuilt as an NS AC44C6M. 8929 GE Dash 9-44CW D9-44CW Unit has since been repainted in the horsehead scheme. 8930 GE Dash 9-44CW D9-44CW Unit has since been repainted in the horsehead scheme. 8931 GE Dash 9-44CW D9-44CW Unit has been retired for rebuilding as an AC44C6M. 8933 GE Dash 9-44CW D9-44CW Rebuilt as an NS AC44C6M. 8934 GE Dash 9-44CW D9-44CW Rebuilt as an NS AC44C6M. 8935 GE Dash 9-44CW D9-44CW Rebuilt as an NS AC44C6M. 8936 GE Dash 9-44CW D9-44CW Unit has since been repainted in the horsehead scheme. 8937 GE Dash 9-44CW D9-44CW Unit has since been repainted in the horsehead scheme. 8938 GE Dash 9-44CW D9-44CW Unit has since been repainted in the horsehead scheme. 8939 GE Dash 9-44CW D9-44CW Rebuilt as an NS AC44C6M. 8941 GE Dash 9-44CW D9-44CW Unit has since been repainted in the horsehead scheme. 8942 GE Dash 9-44CW D9-44CW Unit has since been repainted in the horsehead scheme. 8943 GE Dash 9-44CW D9-44CW Unit has since been repainted in the horsehead scheme. 8944 GE Dash 9-44CW D9-44CW Rebuilt as an NS AC44C6M. 8945 GE Dash 9-44CW D9-44CW Unit has since been repainted in the horsehead scheme. 8946 GE Dash 9-44CW D9-44CW Rebuilt as an NS AC44C6CF. 8947 GE Dash 9-44CW D9-44CW Unit has since been repainted in the horsehead scheme. 8948 GE Dash 9-44CW D9-44CW Rebuilt as an NS AC44C6M. 8949 GE Dash 9-44CW D9-44CW Unit has been retired for rebuilding as an AC44C6M. 8950 GE Dash 9-44CW D9-44CW Rebuilt as an NS AC44C6M. 8951 GE Dash 9-44CW D9-44CW Unit has been retired for rebuilding as an AC44C6M. 8952 GE Dash 9-44CW D9-44CW Rebuilt as an NS AC44C6M. 8953 GE Dash 9-44CW D9-44CW Unit has since been repainted in the horsehead scheme. 8955 GE Dash 9-44CW D9-44CW Rebuilt as an NS AC44C6M. 8956 GE Dash 9-44CW D9-44CW Rebuilt as an NS AC44C6M. 8957 GE Dash 9-44CW D9-44CW Unit has been retired for rebuilding as an AC44C6M. 8959 GE Dash 9-44CW D9-44CW Unit has been retired for rebuilding as an AC44C6M. 8960 GE Dash 9-44CW D9-44CW Rebuilt as an NS AC44C6M. 8961 GE Dash 9-44CW D9-44CW Rebuilt as an NS AC44C6M. 8962 GE Dash 9-44CW D9-44CW Unit has since been repainted in the horsehead scheme. 8963 GE Dash 9-44CW D9-44CW Unit has since been repainted in the horsehead scheme. 8964 GE Dash 9-44CW D9-44CW Rebuilt as an NS AC44C6M. 8965 GE Dash 9-44CW D9-44CW Rebuilt as an NS AC44C6M. 8966 GE Dash 9-44CW D9-44CW Rebuilt as an NS AC44C6M. 8968 GE Dash 9-44CW D9-44CW Unit has since been repainted in the horsehead scheme. 8969 GE Dash 9-44CW D9-44CW Unit has since been repainted in the horsehead scheme. 8970 GE Dash 9-44CW D9-44CW Rebuilt as an NS AC44C6M. 8971 GE Dash 9-44CW D9-44CW Rebuilt as an NS AC44C6M. 8972 GE Dash 9-44CW D9-44CW Rebuilt as an NS AC44C6M. 8973 GE Dash 9-44CW D9-44CW Unit has since been repainted in the horsehead scheme. 8974 GE Dash 9-44CW D9-44CW Unit has been retired for rebuilding as an AC44C6M. 8975 GE Dash 9-44CW D9-44CW Unit has since been repainted in the horsehead scheme. 8978 GE Dash 9-44CW D9-44CW Unit has been retired for rebuilding as an AC44C6M. 8979 GE Dash 9-44CW D9-44CW Unit has since been repainted in the horsehead scheme. 8980 GE Dash 9-44CW D9-44CW Unit has since been repainted in the horsehead scheme. 8982 GE Dash 9-44CW D9-44CW Rebuilt as an NS AC44C6M. 8983 GE Dash 9-44CW D9-44CW Rebuilt as an NS AC44C6M. 8984 GE Dash 9-44CW D9-44CW Rebuilt as an NS AC44C6M. 8985 GE Dash 9-44CW D9-44CW Unit has been retired for rebuilding as an AC44C6M. 8986 GE Dash 9-44CW D9-44CW Rebuilt as an NS AC44C6M. 8987 GE Dash 9-44CW D9-44CW Unit has since been repainted in the horsehead scheme. 8988 GE Dash 9-44CW D9-44CW Unit has been retired for rebuilding as an AC44C6M. 8990 GE Dash 9-44CW D9-44CW Rebuilt as an NS AC44C6M. 8991 GE Dash 9-44CW D9-44CW Unit has been retired for rebuilding as an AC44C6M. 8993 GE Dash 9-44CW D9-44CW Rebuilt as an NS AC44C6M. 8994 GE Dash 9-44CW D9-44CW Unit has been retired for rebuilding as an AC44C6M. 8995 GE Dash 9-44CW D9-44CW Unit has been retired for rebuilding as an AC44C6M. 8996 GE Dash 9-44CW D9-44CW Unit has since been repainted in the horsehead scheme. 8997 GE Dash 9-44CW D9-44CW Rebuilt as an NS AC44C6M. 8998 GE Dash 9-44CW D9-44CW Unit has since been repainted in the horsehead scheme. 9000 GE Dash 9-44CW D9-44CW Unit has been retired for rebuilding as an AC44C6M. 9002 GE Dash 9-44CW D9-44CW Unit has since been repainted in the horsehead scheme. 9005 GE Dash 9-44CW D9-44CW Rebuilt as an NS AC44C6M. 9007 GE Dash 9-44CW D9-44CW Unit has been retired for rebuilding as an AC44C6M. 9010 GE Dash 9-44CW D9-44CW Unit has since been repainted in the horsehead scheme. 9012 GE Dash 9-44CW D9-44CW Unit has since been repainted in the horsehead scheme. 9027 GE Dash 9-44CW D9-44CW Unit has since been repainted in the horsehead scheme. 9029 GE Dash 9-44CW D9-44CW Unit has since been repainted in the horsehead scheme. 9030 GE Dash 9-44CW D9-44CW Unit has since been repainted in the horsehead scheme. 9033 GE Dash 9-44CW D9-44CW Unit has since been repainted in the horsehead scheme. 9036 GE Dash 9-44CW D9-44CW Unit has since been repainted in the horsehead scheme. 9040 GE Dash 9-44CW D9-44CW Unit has since been repainted in the horsehead scheme.